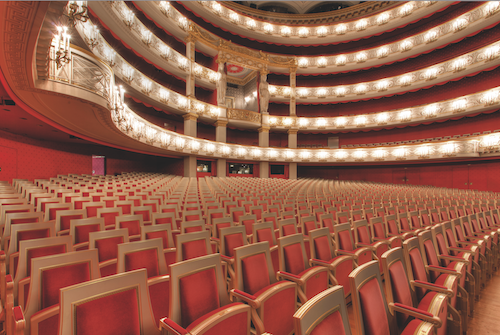 The National Theatre at the Max-Joseph-Platz in Munich is considered one of the most famous opera houses of the world. 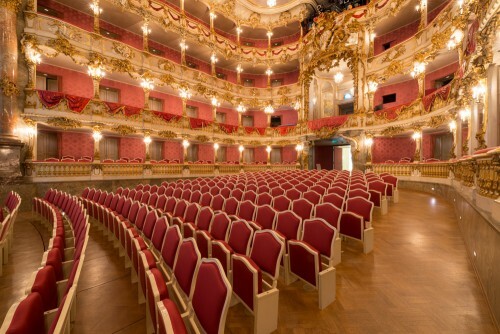 It is the venue of the Bavarian state opera and the Bavarian state ballet. 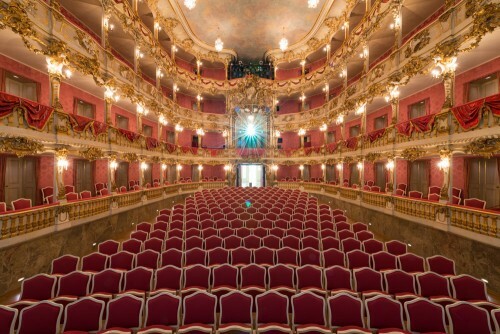 The highlight of the cultural summer in Munich is the Opera Festival that takes place every year. Five weeks full of opera, ballet and concerts. 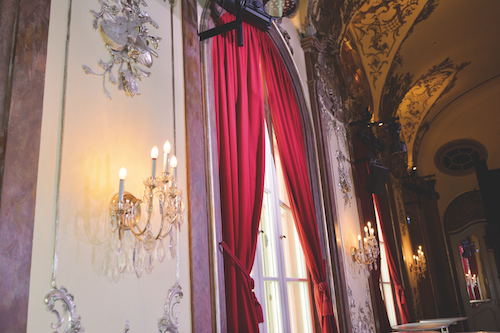 Twenty years ago, the jewelled stage curtain was reconstructed as closely as possible to the original by Buchele according to the original drafts of 1962. Four fifths of the heavy red fabric was destroyed by a fire in the opera in 1993. 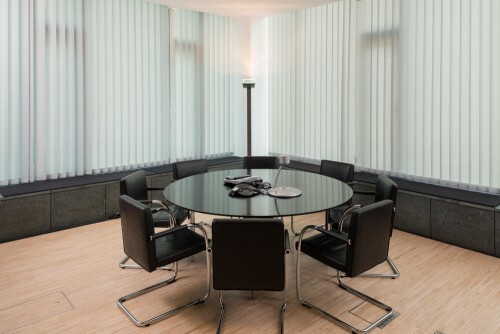 For this purpose, the employees produced a new two-piece, almost six metre high curtain made of heavy fire retardent synthetic fibre, which is composed of two overlapping shells. This assignment required 560 square metres of fabric, each weighing 300 kg. On the centrepiece that was equipped with a so-called Wagner-train, there are six beaming preciously embroidered gold laurel wreathes with a diameter of 1.20 metres. Posamenten-Müller produced sixty tassels, fastened with sewn-on bands and brass buttons for each of the two parts of the curtain. 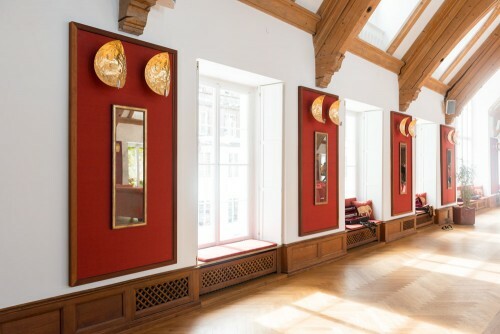 As an exact as possible threaded reconstruction according to a classic Greek model, the custom-made fabric products with interwoven applications can be seen in the crimson wall covering in the auditorium, in the proscenium boxes, the boxes and the cloakroom. In doing so, the signficance and quality of the fabric according to the conditions of the protection of historic monuments was extremely important. Even the new wall covering of the staircases, the surrounding corridors in the individual tiers and the cover of the handrails with mohair-velour was also commendably carried out by Buchele. 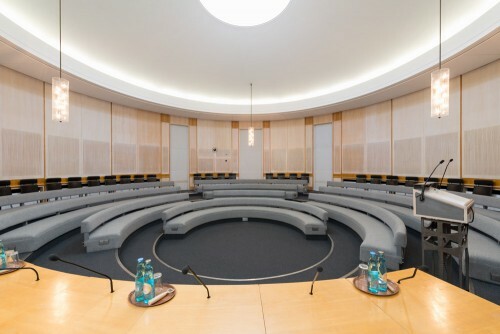 The historical gimp braids for the upholstery and the covering of the seats in the auditorium bear the signatures of Posamenten-Müller and Buchele. Once upon a time there was a cigar lover. 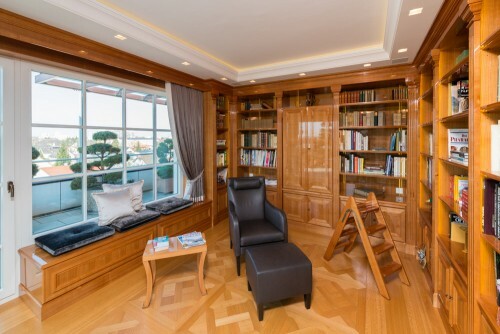 His urban refuge was to be furnished in a manner that is as exclusive as his preferred Cohiba brand. 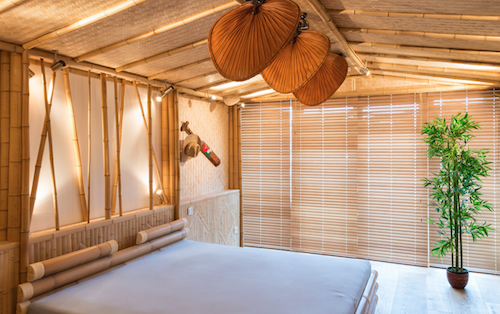 The interior architect Natascha Stöckl and general contractor Bernhard Ruwiedel happily take on such tasks and together with Andreas Buchele, they developed a eccentric bed. The wood construction on the walls was to remind you of a cigar box. 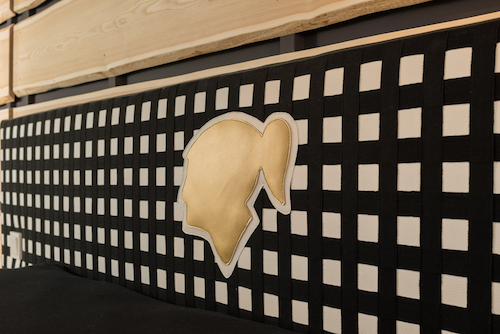 The idea for the bed was to understand the unmistakeable packaging of the individual, purely hand-made cigars: the black-yellow polished bed frame, the chequered head piece made of costly leather and sewn with individually woven braids and the logo that depicts the head of the Cuban Taino-Indian Hatuey, whose language was used for the description of the wrapping of tobacco leaves. A very unique task and the eye-catcher of the apartment. The villa by the lake. 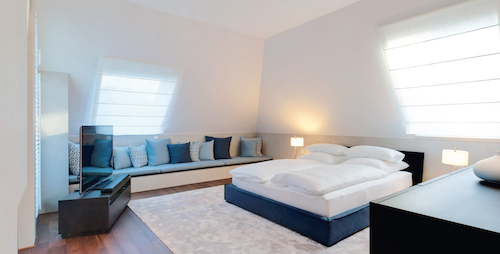 With “subtle flair”, the interior architect and designer Gabriela Raible was able to combine the spacious, classic-elegant newly built villa at Ammersee (Lake Ammer) with a modern puristic Asian style. This interesting mixture with the cosmopolitan atmosphere and a simultaneously communicated feeling of security was planned and designed for each individual floor. “Together we developed many beautiful handcrafted details because Andreas Buchele always picks up the threads”, she said about the implementation of the room concept with no less than fourteen different themed worlds. 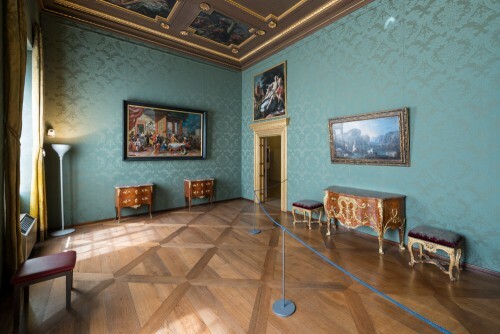 Colours played an important role in the design of the ensemble of the room. The realisation of the many ideas – for the nursery, the living room, the TV lounge and the fitness room –, were processed by both interior partners, Raible and Buchele, with the help of a multi-coloured fabric collage. Materials such as jute and linen were processed for cushions, curtains and Roman blinds. The difficulty of the tight deadline was mastered with bravura by the Buchele team. Prof. Dr. Reinhold Baumstark (General director of the Bavarian State Painting Collections, 1999-2009): Anyone in search of the Old Pinakothek in Munich, one of the great treasure houses of Europe in the history of painting, will experience the masterpieces presented there in a festive atmosphere in front of a magnificent background. All the halls on the top floor are lined with a silk wall covering with alternating colours from deep green and to purple to changing red. During one year, starting in summer 2008, Buchele Raumgestaltung created this precious dress for the portrait gallery, in the face of the monumental dimensions of the room, an achievement of a highly creative skill and precise craftsmanship. However, the twelve months, in which the enormous lengths of cloth were sewn, fastened, tightened and carefully adapted to the circumstances, were preceded by many years of planning and testing. First of all, the material had to be determined and tested: single colour, plain silk, whose shimmer had to be subordinate to the shine of the painting to be presented on the material. 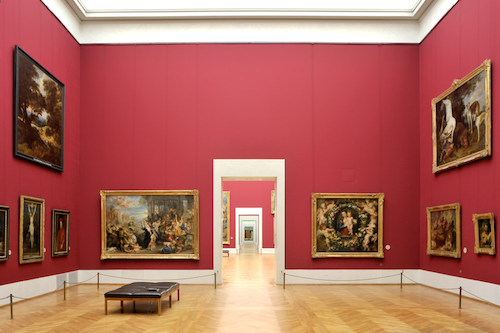 The silk faille was woven in Lyon with a structure developed especially for the Old Pinakothek, however, prior to this, the aim was to agree on the colour values of red and green. 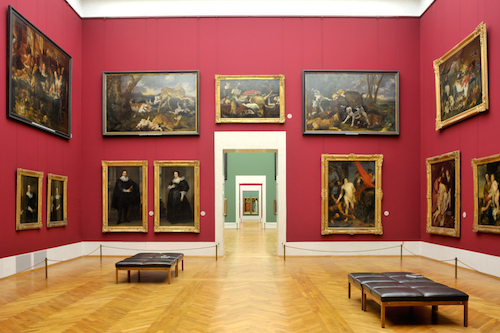 Again and again new lengths of material from Lyon with a different traverse of both colours were sent to Munich, where they were examined under the lighting conditions of the Old Pinakothek and in immediate vicinity to the masterpieces. The long process led to a positive result and ancient masters now shone in a new splendour. With this work, Buchele committed to a time-honoured tradition. 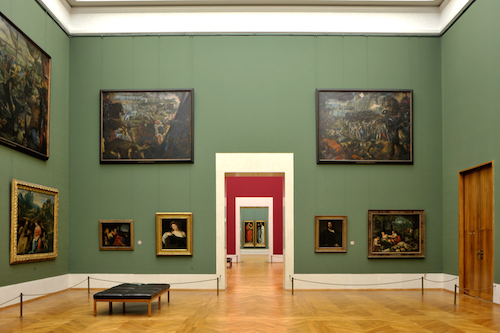 Since the 16th century, portrait galleries were lined with silk and usually in the colours red and green, be it Florence or Vienna, Paris or St. Petersburg, Madrid or London. 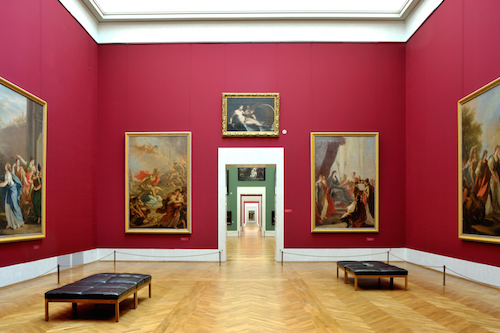 Even for the Old Pinakothek, the constructor King Ludwig I of Bavaria and the architect Leo von Klenze also decided on this colour tone as well as the use of plain silk as the material and in doing so, since 1836 reaching far into the 20th century, the paintings in Munich were linked in a festive ambience. 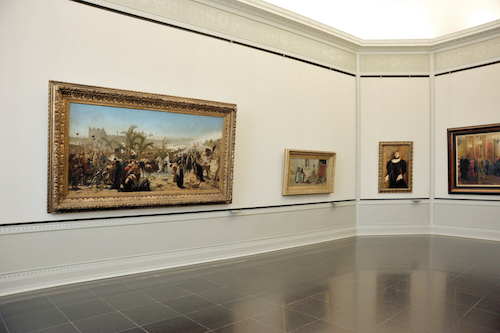 However, since the reconstruction of the war-destroyed Old Pinakothek, there was no desire to rely on the old colour values. Usually grey as well as velvet greatly reduced in colour provided an atmosphere of cool restraint. 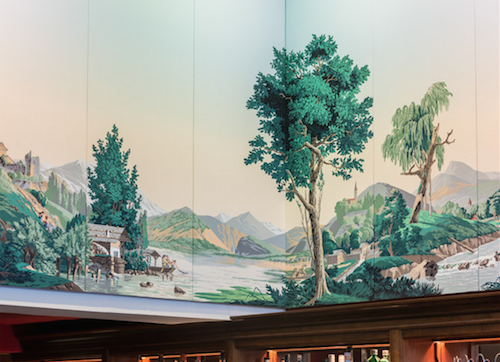 On the other hand, now the new silk wall covering made an appearance with much more self-confidence: Legitimised by historical models and strengthened by the harmonious accord with the paintings, it increases their enjoyment thanks to the classy material, valuable chromaticity and highest handcrafted skill. 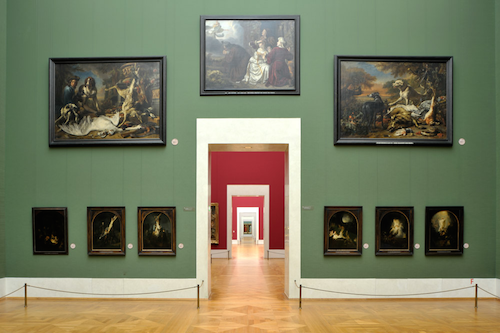 Dr Bernhard Maaz (former head of the Old National Gallery and today’s general director of the Bavarian State Painting Collections): Emaculate, bright, fresh, full of nuances – naturally correct and good, this was the impact the wall coverings of the Old National Gallery had even one and a half years after their installation. The colours are fresh, half a dozen fine tones which, when looking back, you would not have wanted to have chosen differently: This wall covering is dedicated to art, this was our entire motto. 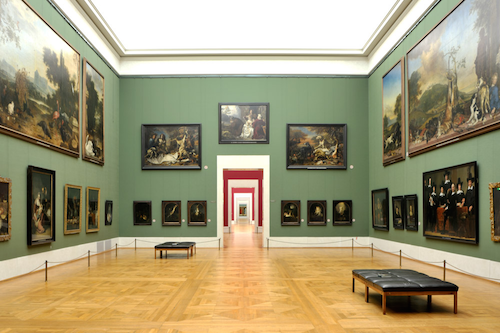 In doing so, the exhibition rooms of the Old National Gallery with the Buchele wall coverings form one of the most beautiful, convincing solutions we were even able to find within the German museum landscape due to modesty, nobleness and perfection. The visible and yet inconspicuously structured wall covering appears to be full of implicitness. Large areas, small fields, curved walls – nothing was an obstacle, even if what was actually used to cover flat areas, had to be applied to the round, concave areas. 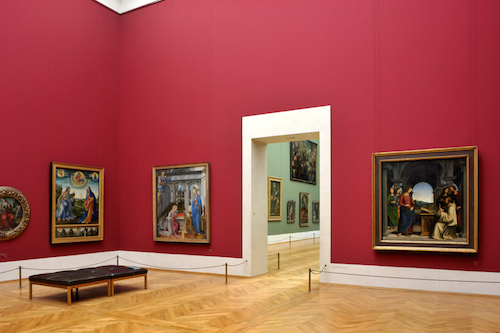 Each room group usually has one stylish, sometimes sonorous, and bright colour: traditional red, calming blue, modest serviceable grey and a few lighter colours cross the building and do not just classify the five dozen exhibition rooms, which are each part a group, but also the presentation of the art works presented therein: The red inspires the exhibition of works from the era between outdoor painting and salon, the light blue and the lime green suggest the presentation of art from the Goethe age and romantic period: Each colour serves the paintings as well as their gold frames and deep colours, yes, even the marble-white sculptures and the bronze-black sculptures. 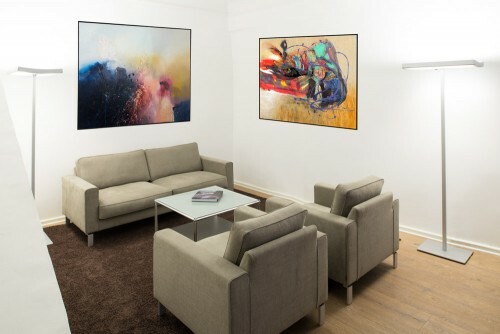 The colours help the art, the fabrics help the aesthetics, furthermore however, their fibre structure serves the acoustic reassurance and their hygroscopic abilities serve the conservative optimisation. A unique exhibition element and so many beneficial aspects! The time around summer 2001 is unforgettable because the colours that were developed in long, patient and careful coordination, were finally part of the rooms: With bee-like industriousness and stoic calm, the employees of Buchele sewed together the lengths of material in the rooms, as if to suggest the fabrics had not only to adjust to the respectively designed room temperature but also to the light and the dimensions. Machines hummed in almost completed rooms: Whoever has been charge of construction over the years, knows that this almost final step after all the shell construction, after brick walling and installing steel beams, after wall plastering and laying of installations, means – completion. And everyone who witnessed it, experienced moments of pure joy. 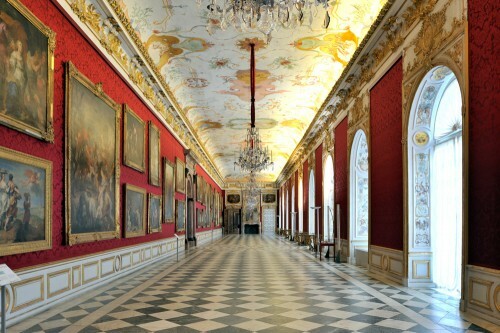 The mink gives rise to the king – and the wall covering ennobles the hall to what it is: both are insignia of perfection, completion in both senses of the word. Retrospectively – and even in a currently legitimate comparison with other similar sites and museums – there is still a lot more than can be said about it. The same amount of attention is not paid to the so-called finishing touches everywhere and not everyone shares the same ultimate importance that is placed on the craftsman-like ethos. 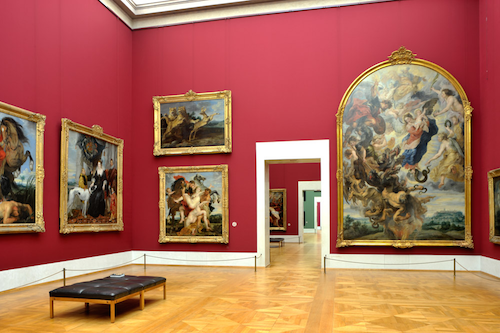 Not all public authorities and not each comparable employee, knows what it means to ultimately avoid of the use of cover strips and braids in order to spare the arts any decorative and thus, competitive elements on the ever valuable and noble covered museum walls. The long and meaningful effort that did not spare the precious coordination or the distribution of the seams in the respective walls, was worth it and will stay crowned with the best results. 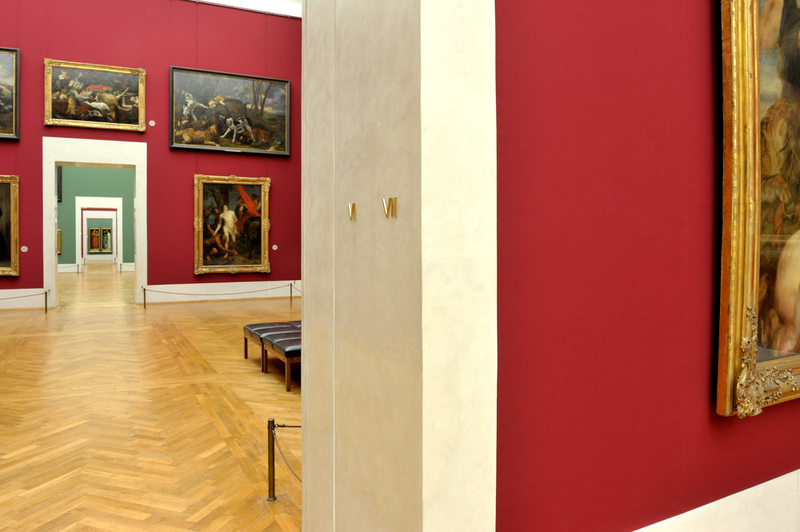 Buchele’s walls in the Old National Gallery are a crucial element ensuring that to date, many people still consider this 1998-2001 renovated building as one of the most beautiful museums. 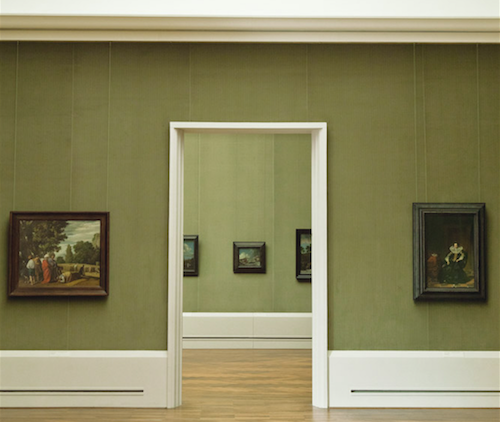 The construction was to be a “treasure house” and that is what it became: The Gemäldegalerie Berlin [picture gallery], a discreet gem in the cultural forum ensemble of the Prussian Cultural Heritage Foundation. 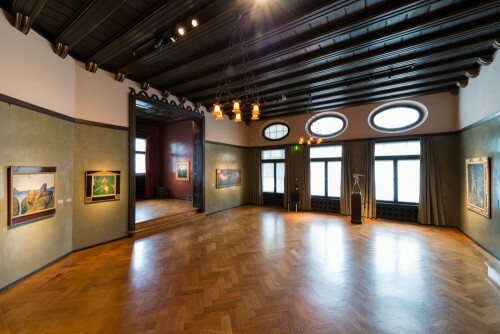 Opened 1998 after eight years of construction and created in a classic design according to the plans of Himler & Sattler architects from Munich (today Hilmer & Sattler und Albrecht), this building will also fascinate you because of its inner values: Nine hundred brilliant works of western painting of the thirteenth to eighteenth century are showcased here. 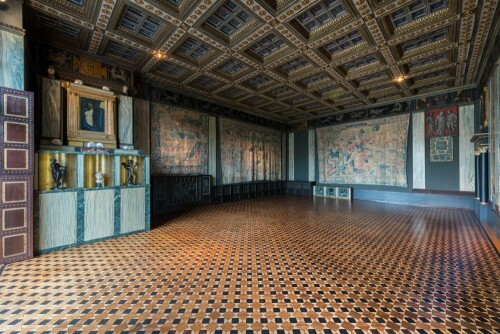 The halls and cabinets are lined with blue, red, green and grey velvet, sewn panel after panel. Velvet means the secret. This special fabric softens the light, enables the paintings to shine and inevitably pushes them into the foreground. 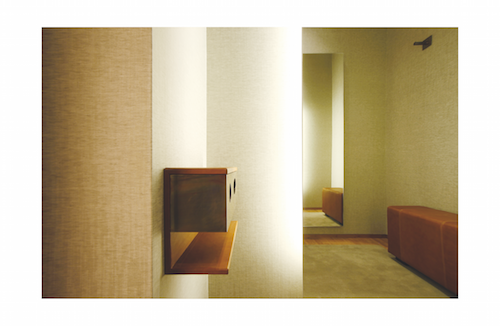 Architect Christoph Sattler explains: “First, a practice room was created in order to decide on the fabric qualities, processing on the wall, the development of the seams and most importantly the colouring, as part of a lengthy process. Finally, this made it possible to quickly and efficiently execute the production process”. And to continue: “Buchele’s work admittedly is excellent on an international level, even in terms of the competitive pricing. Between 1914 and 1916 Carlo Sattler, grandfather of Christoph Sattler built Schloss Elmau in Klais near Garmisch-Partenkirchen on behalf of the founder and theologist Johannes Müller. Lord of the castle, Dietmar Müller-Elmau constantly renovated the historic building and developed it into a luxury hotel and spa until it was destroyed by a major fire in August 2005. The reconstruction was possible according to mutual plans with the architects. In addition, Christoph Sattler highlights: “With an astonishing, near superb fantasy, Buchele is able to respond to the frequently changing ideas of the constructors and architects with regard to Elmau.” In summer 2007, the new Schloss Elmau was reopened with its 128 individual rooms. 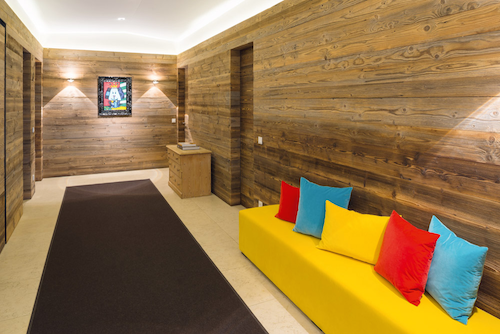 Dietmar Müller-Elmau’s idea was to allow people in this scenically incredibly place to experience how to be a guest and friend in a private atmosphere. 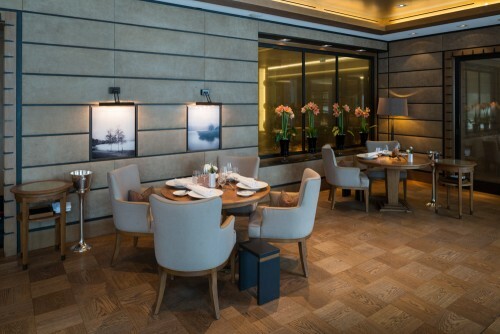 It is no accident that the runners in the entrance area, the curtains in the rooms, the wall covering and Roman blinds in the fireplace lounge and dining room and the interior of the “Fidelio” restaurant contribute to this intimate sense of well-being. 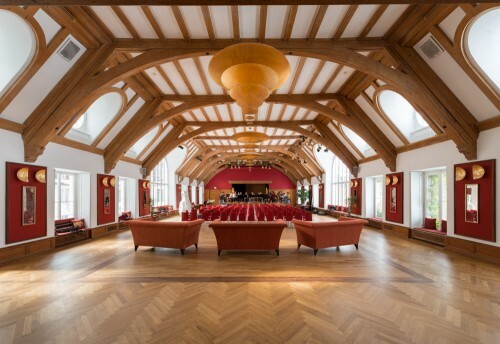 Under the roof of the historical Tutzing Castle at Lake Starnberg the Evangelical-Lutheran church in Bavaria with its academy created a formidable meeting place, from a sociopolitical point of view. In terms of a think and discussion workshop, it encourages mutual exchange and the search for solutions for the challenges presented by the times. Carefully organised events such as lectures on current topics, seminars and conferences with top-class speakers offers the platform for discussions and impulses that are effective in politics, economics, culture, media and the church. 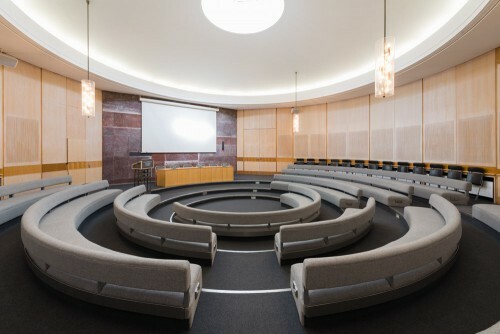 The round auditorium is the centrepiece of the academy, which was designed by architect Olaf Andreas Gulbransson in 1959, predominantly used as a lecture and music hall. 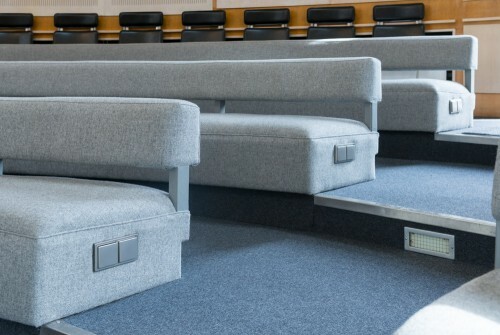 The seats with backrests were completely re-upholstered by Buchele Raumgestaltung and covered in a new fabric. 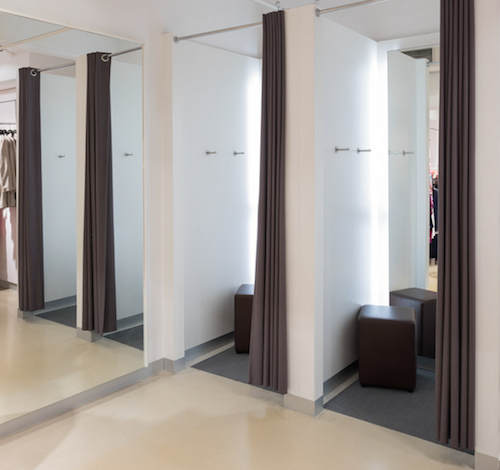 The salons are located on the first floor and their re-design was carried out under the aegis of Scheer Architekten: “For the retreading, we developed new coordinated furnishings, carpets and curtains, which subtly conveyed the character of the salon. 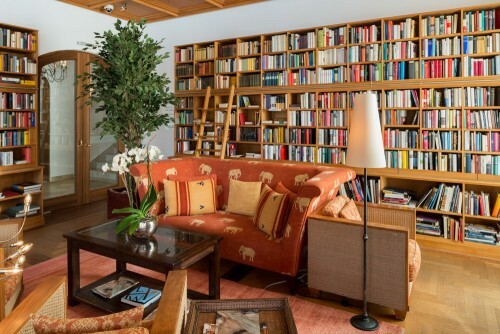 Buchele has a very broad room design programme and particularly, the craftsman background – cushions here and curtain there – and thus, was predestined for the academy”, Wilhelm Scheer, who manages the architecture company in Munich with his wife Rose Birnbeck-Scheer. “We still do things together, we mesh very well together and know the value of one another. Buchele is very established and you cannot find this so easily anywhere else. We work together hand in hand because in Tutzing Castle we constantly make adjustment and changes in order to preserve the exclusivity of this location. 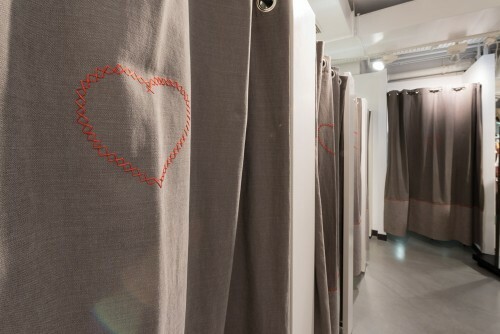 The different salons are located on the first floor and their re-design was carried out under the aegis of Scheer Architekten: “For the retreading, we developed new coordinated furnishings, carpets and curtains, which subtly conveyed the character of the salon. 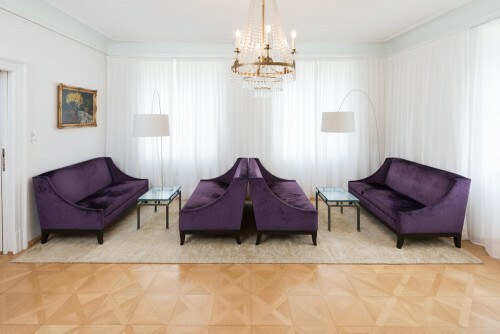 Buchele has a very broad room design programme and particularly, the craftsman background – cushions here and curtain there – and thus, was predestined for the academy”, Wilhelm Scheer, who manages the architecture company in Munich with his wife Rose Birnbeck-Scheer. “We still do things together, we mesh very well together and know the value of one another. Buchele is very established and you cannot find this so easily anywhere else. We work together hand in hand because in Tutzing Castle we constantly make adjustment and changes in order to preserve the exclusivity of this location. 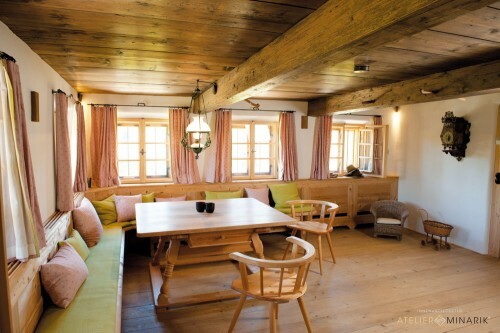 In the Bavarian alpine upland rare preciousness represented by a historic, neat farm from the 17th century. Today it has a harmonious comfort that is due to the overall concept of the interior architect Sebastian Minarik and Johannes Wegmann. It took two whole years to design the inside and outside of the demanding construction project that perfectly fits into the picturesque landscape. 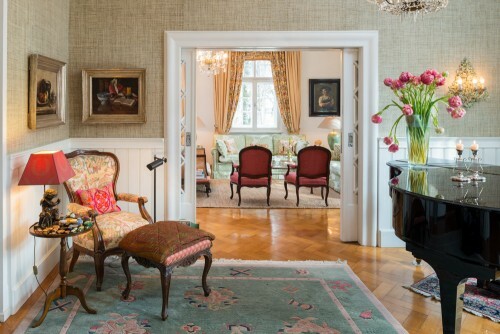 In the middle of the construction period, Sebastian Minarik consulted his long-standing business partner Andreas Buchele for the decorations/curtains and upholstery work in the living room, parlour, bedrooms, barn loor and alcoves. The close cooperation during the planning and implementation of all tasks by the skilled Buchele employees resulted in a showcase. 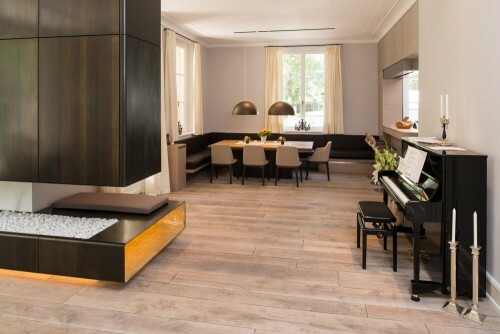 Back to the regional capital: A new-build apartment in Munich with a living space of 500 sqm. 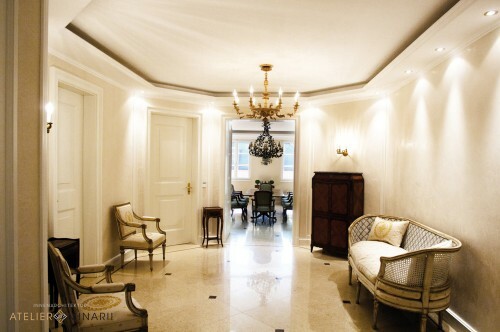 The interior should be classic and conservative. 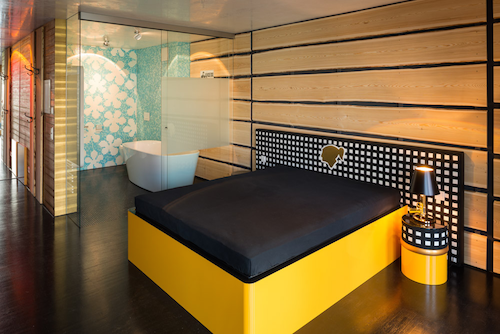 All the details of room design were individually designed by interior architect Sebastian Minarik and realised together with Andreas Buchele. 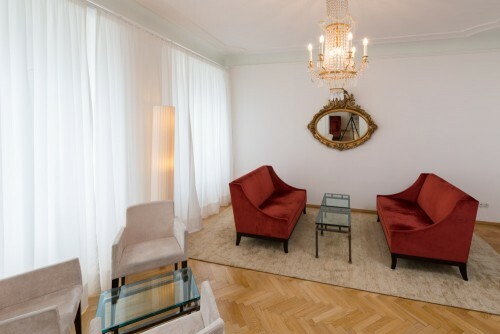 The special feature: the made-to-measure carpet for the salon made of one piece with a surface of 80 sqm. 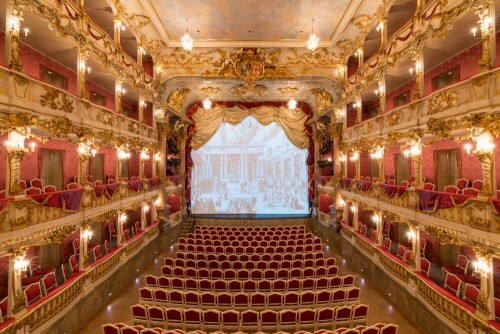 In order to highlight the aristocratic character of the premises, the decorations and half-drawn, complex stage curtains on the windows, historically reconstructed according to old curtains. 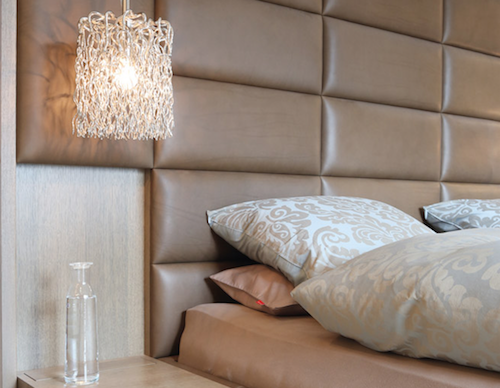 Tassels, strings were created by Posamenten Müller as well as the welting for chairs, sofas and seat cushions. The benches and stools were covered by Buchele with valuable damask fabric. 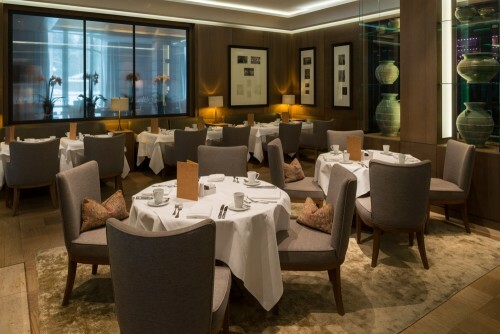 On the highest level of excellence: In 2014, top chef Christian Jürgens was crowned by the Michelin Guide with three stars, as its highest distinction. 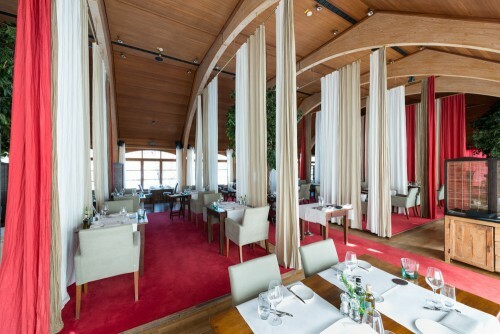 In the Überfahrt in Rottach-Egern restaurant, he spoils gourmets from near and far with his fine and ingenious creations. 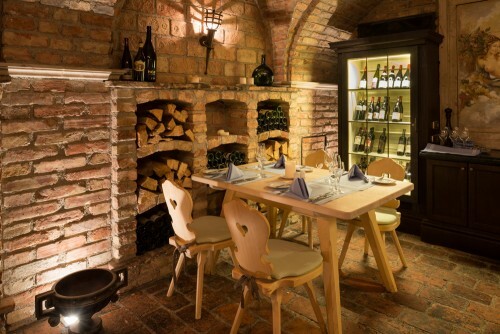 He has the following to say about the contemporary and modest atmosphere of his restaurant: “I originally advertised the renovation of our chairs. I was so satisfied with the result that I wanted to include my entire restaurant. After examining the offers, I deliberately chose Buchele Raumgestaltung. I was impressed by the expert knowledge, the support, but mostly the dedication and passion, with which this company worked. This applies to the boss and all employees, who sometimes also carry out the pending, yet necessary textile cleaning activities. Because I myself live by authenticity, quality, passion, dedication and reliability, from my point of view it is not a surprise that in doing so, I inevitable encountered the Buchele company and boss Andreas Buchele. 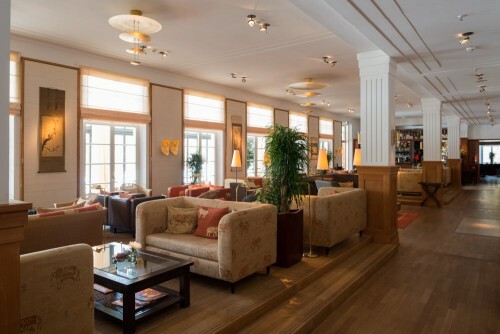 People in the hotel: Tegernsee in picturesque surroundings is located idyllically and exudes a magical force of attraction on people from all around the world. The ferrymen on the lake gave the restaurant “Überfahrt” on the shore it’s name, which in 1837 was opened as “Gasthof zur Überfahrt” in Rottach-Egern. 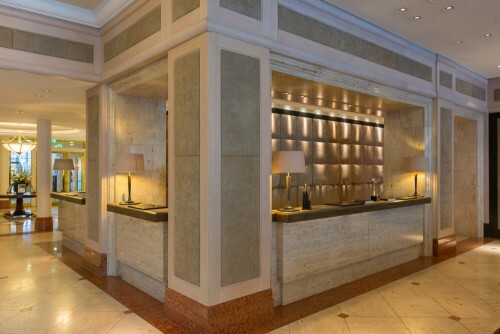 Today, the 5* hotel is one of the very biggest names in the valley. 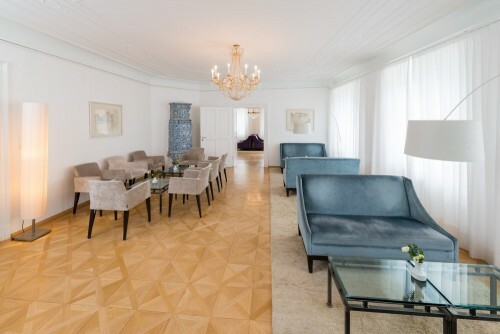 Hotel director Vincent Ludwig originally commissioned Andreas Buchele for the technical expertise on the existing upholstery in the building. 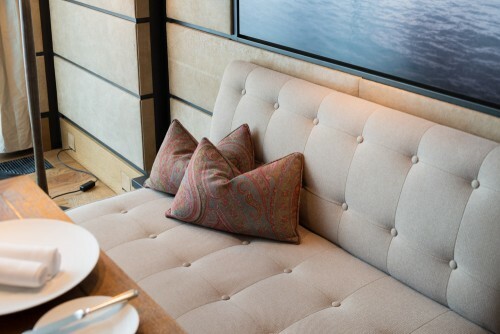 But soon enough, it was no longer just about the quality assurance of the upholstery but also about high quality overall concepts for a large part of the restaurant and the ambience of the elegant lobby with this very unmistakable vibrant atmosphere. This area being the most important part of the luxury lodging was completely reconditioned in terms of furnishings after in depth consultation: in terms of colouring, the quality of all components and the sustainable and endurable usability of the covers and the furnishings. “Buchele is a reliable partner who helped us with words and deeds. He helped us with the conscientious selection and preparation of materials and with the constant maintenance of the hard-wearing textile materials in the entire house”, said the general manager. “Let us work with Buchele because you know it will work” is what is also said during the consultation for the interior planning of the associated event location “Fährhütte 14”, which since 2014 shone in new splender with original charm. 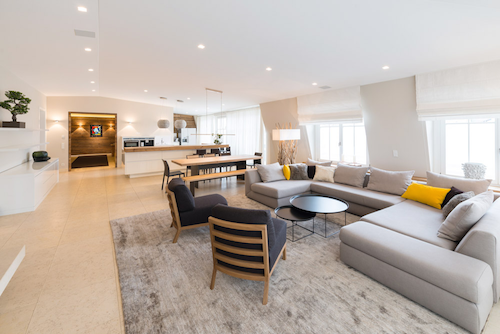 With an internal architectural overall concept, which serves both the classic as well as the modern areas, interior designer Uwe Kirschmann and his team create living spaces that are not just beautiful but also practical. 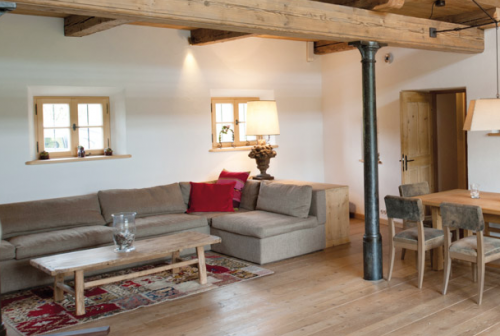 For the complete reconstruction and redesign of a single-family dwelling on the outskirts of Munich, he resorted back to the tried and tested cooperation with Andreas Buchele, with whom he has realised many projects for some time. The fabrics, curtains, decorations, covers, leather and upholstery that were not just necessary for this project are also part of the Buchele Raumgestaltung portfolio. 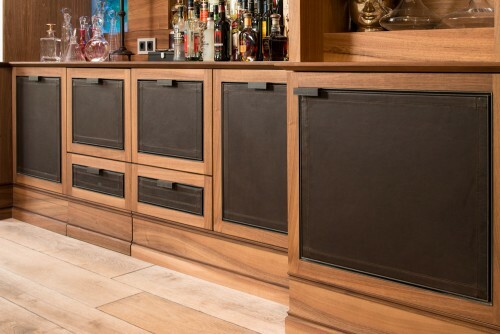 Thus, even very specific items such as door components covered in leather in the dressing area of this house. 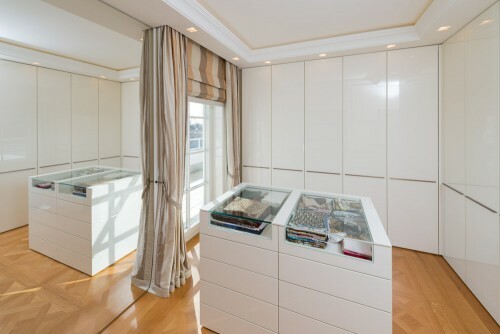 “We make the plan and together we define the colour concept, material selection and design”, said the interior decorator, who advises his customers in his showroom. 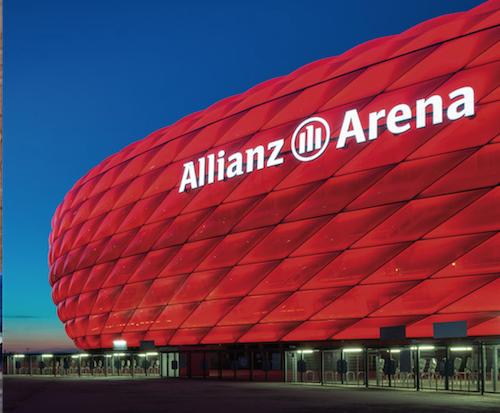 “Buchele is a building block of our realisation” – this also applies to the concept of a private company logo in a very special location: In the Allianz arena, home of FC Bayern. The perfect place to experience games up close in the stadium. The 2015 newly rented box has enough space for ten people. 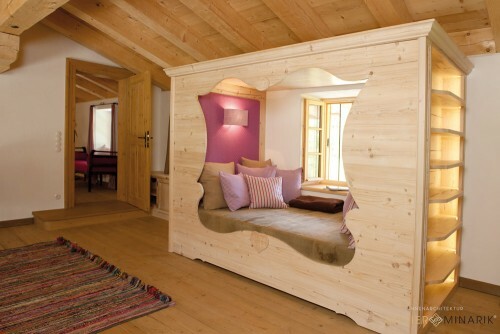 It was designed by Kirschmann Interior in a contemporary design. 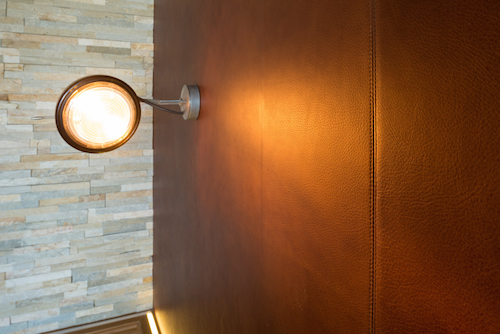 Individual wall elements created by the carpenter were covered with the finest leather by Buchele, the decorative curtain for the large glass front with view of the playing field was sewn by hand. When drawn, it transforms the box with comfortable chairs in a comfortable and elegant “living room” after an exciting football match..
Everyone has heard the name Alois Dallmayr, the name of the world-famous delicatessen shop in the heart of Munich with its classic yellow and white structured facade. 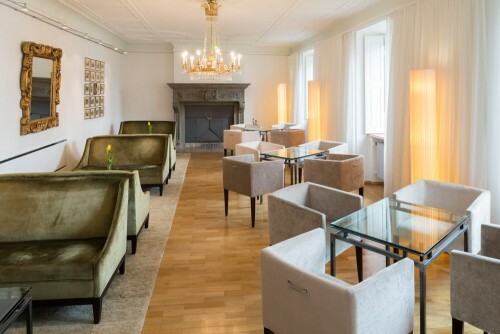 The unmistakable traditional house at Marienhof on the back of the new town hall has been a synonym for coffee and tea for a long time and a guarantor for its prime quality. 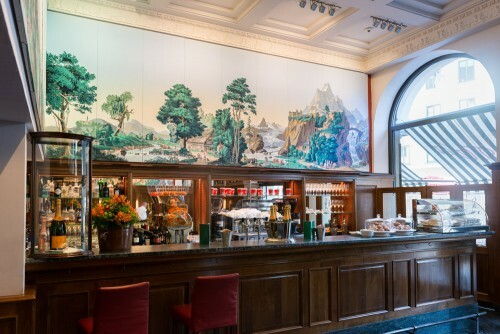 To date, both special departments, set up at the former purveyor to the Royal Bavarian Court in the 1930s, are centres of attraction for demanding customers ranging far beyond the borders f Bavaria. 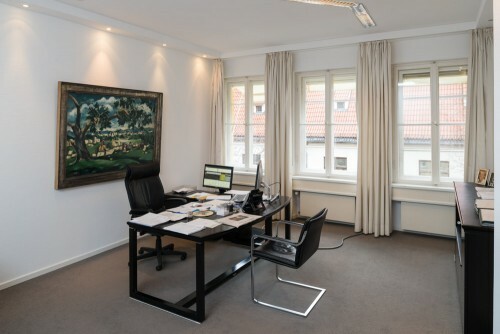 Wolfgang Wille, responsible for the coffee and tea business as the managing partner, not only had the office and meeting rooms tastefully furnished but also consulted Buchele Raumgestaltung for the private living space. 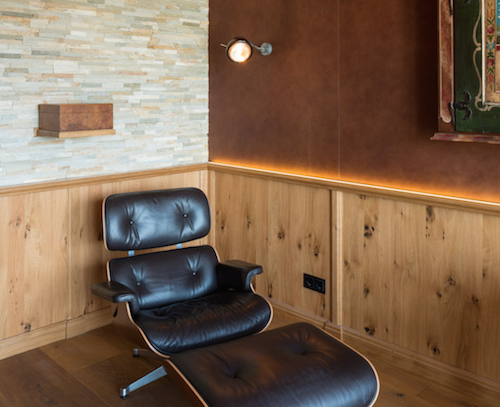 “To the utmost satisfaction and excellent high quality work”, is the way in which, Andreas Buchele designed the holiday home of the family in Tirol and thus, wife, Marianne Wille decided to give the private residence in Munich a “beauty treatment”. “I have enough fantasy to be able to work without an interior architect”, she said. “Andreas Buchele comes to see me, we have a detailed discussion, he understands me, knows what I want and gives me what I want. The fact that we live in a slightly advanced generation and have specific ideas concerning our furnishing, does not pose a problem for him”. Thus, all individual demands of the business household can be exclusively met following mutual discussion of the details. 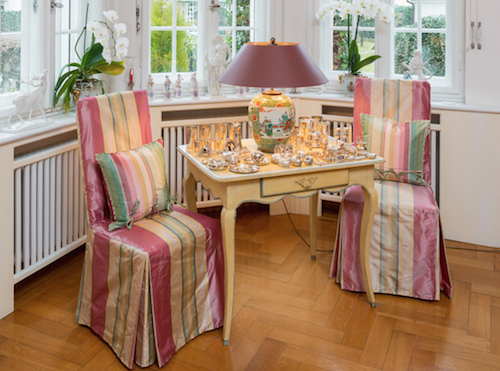 Elegant sofa covers, carpets of lasting value, opulent curtains, Roman blinds and chair covers for the chairs at the large, inviting dinner table are the works of Buchele. 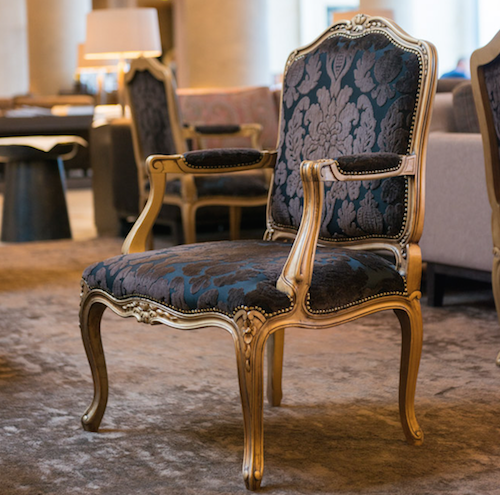 An uncomplicated quality of living is very important to Marianne Wille: “The chair covers need replacement chair covers”, she says laughing at the host of eight grand children… . 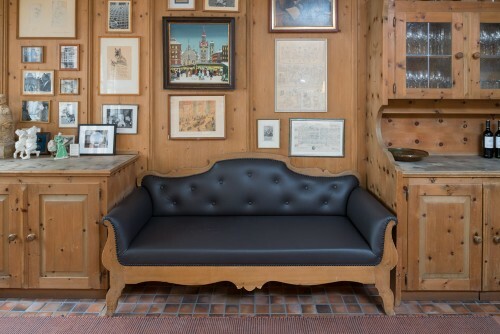 In the same year, in which the saddler and master upholsterer, Anton Buchele set up his interior design company, the Munich-based shoemaker Eduard Maier was appointed purveyor to the Royal Bavarian Court in 1895 in recognition of the company’s achievements. 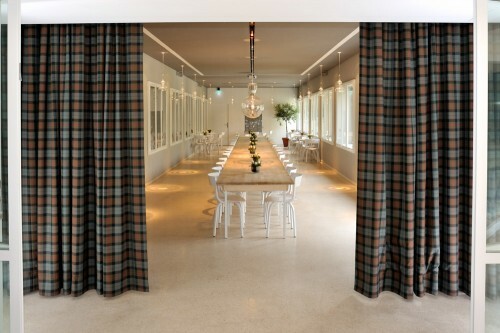 After relocating the business from the residence – in the Briennerstraße – where Buchele produced the large striped awnings – Peter Eduard Meier opened the Gamsbar in 2013 right next to it in a noble setting. 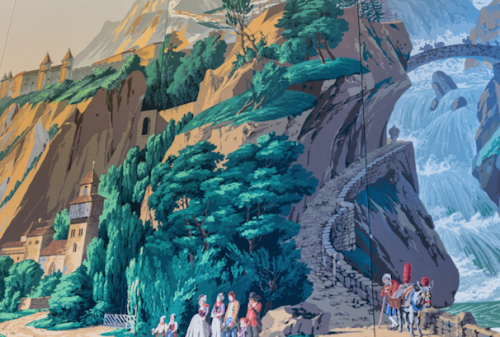 The effective panoramic wallpaper with the Swiss mountain range is seen hanging on the wall behind the counter. It originates from the workshop of the French traditional manufacture, Zuber, and today the work is still carried out by printing with 1,024 wooden models by hand and thus, the item is “immediately considered an antique”. Buchele correctly mounted this valuable wallpaper on to the panels. “From awnings, wallpaper, carpets through to a dignified mourning band for the Ed Maier carriage at a burial – everything was done by Buchele in the service of the former purveyor to the court”. 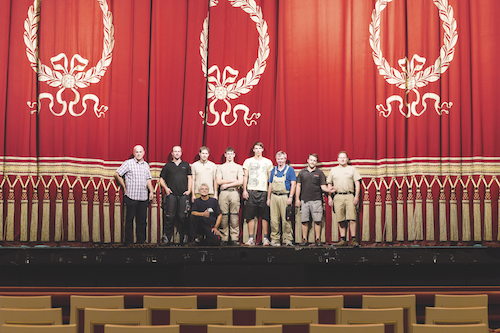 The Deutsches Theatre in the social and cultural landscape of the regional capital Munich has assumed a very special status for more than one hundred years and has been known as the “palace of smiles, the house light entertainment, the stronghold of the Munich Fasching (carnival)”. The majority of the building was destroyed in 1941 by a bombing raid and it was only in the mid 50s that it was reconstructed. 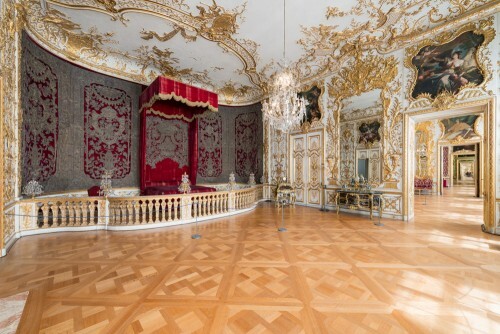 The neo-baroque Silver Hall was the only room that remained within the theatre ensemble built in 1896 in the Schwanthalerstraße, which in 2003 however, had to be closed to the public for reasons of safety. 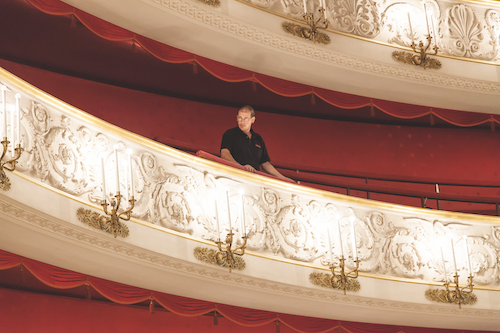 The jewel with all its grand ceiling frescos was restored, as part of the ten year long overall reconstruction of the Deutsches Theatre by the Munich-based architecture firm, doranth post architekten. In doing so, the static protection of the historical Rabitz ceiling in danger of collapsing, was one of the greatest challenges for all planners involved; it was a technical masterpiece. 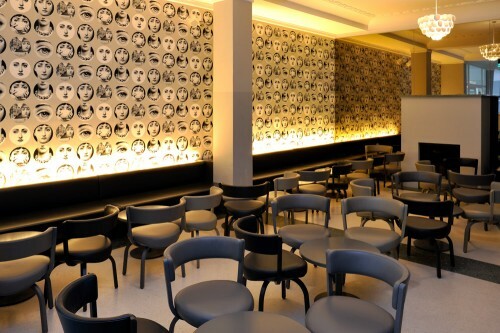 Today, the Silver Hall can be used independent of the theatre business, it has a separate entrance and modern bar. 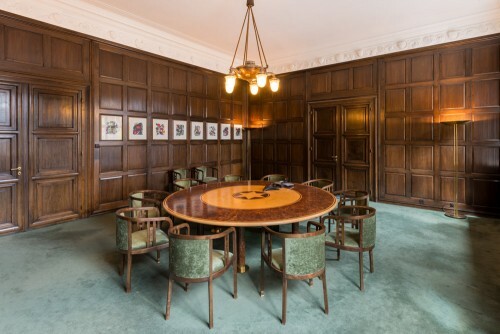 In January 2013, opened with all necessary modern functions, the Silver Hall was presented in a virtually unchanged form with the small stage, historical parquet floor and the original doors. The windows covered with shutters were reopened and were given curtains for acoustic and darkening purposes according to historical models. 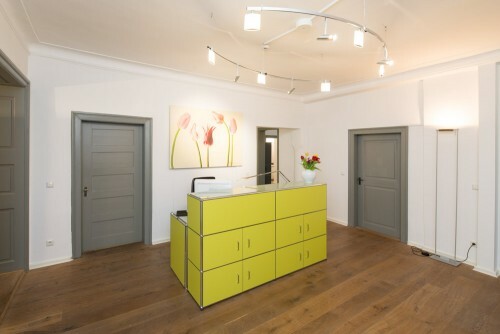 For this purposes, doranth post architekten consulted the specialists of Buchele Raumgestaltung. 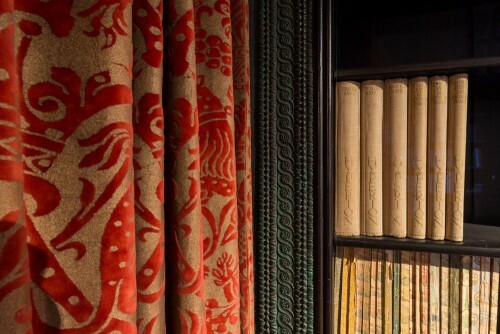 The opulent velour fabric curtains produced in historical red, magnificently presented in the proper light with the decorative tassels and tiebacks. 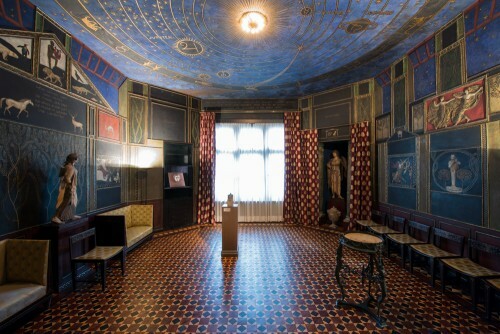 “In 1897/1898 the 34 year old Franz von Stuck established his own artist’s villa at the Isar Heights, according to this own designs, with private living and representation rooms, with an artist’s workshop and garden of sculptures”, says the current head of the collections of the Museum Villa Stuck, Margot Th. Brandlhuber, in the illustrated book “Im Tempel des Ich – Das Künstlerhaus als Gesamtkunstwerk”. 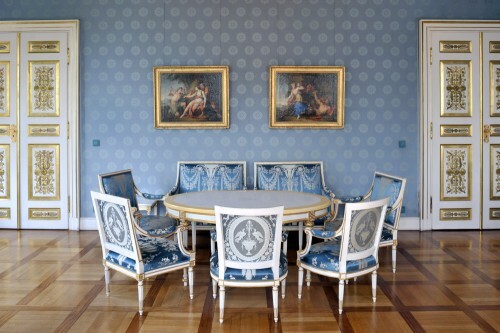 As one of the few monuments in Munich, Villa Stuck is a successful example of how artists really used to build their furniture for themselves according to their own designs. 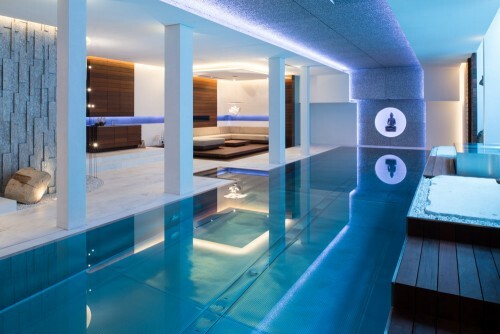 In houses such as this one, life, architecture, art and music in sometimes luxurious spatial installations are also linked as sources of inspiration. Since 1992, the villa of the master painter has been a municipal museum in which historical Stuck living and workshop rooms can be viewed with the main works of the artist. 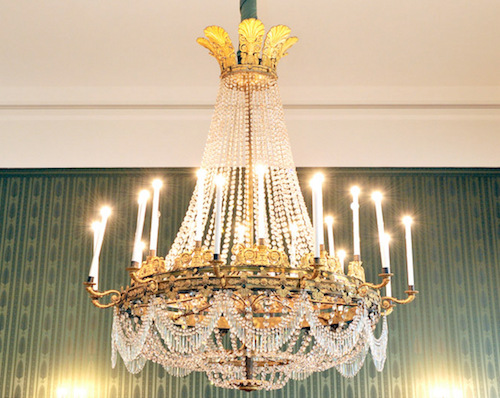 Since 2005, after extensive restoration, the house has been presented in new splendour. It was important to create an optimal framework for the collections. 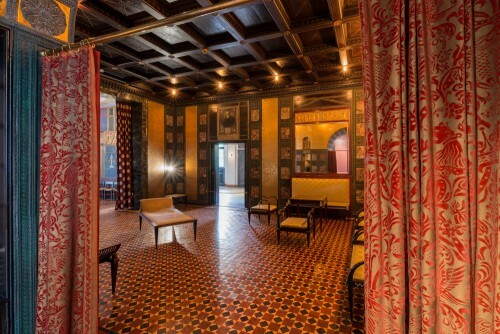 The design of the curtains in the authentic garden hall, the boudoir and the smoking rooms had to be coordinated with the chromaticity of the existing walls. 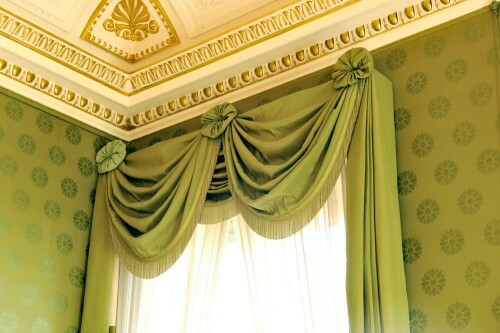 In order to protect sensitive objects from the sun, it is possible to open or close decorative red and green taffeta curtains as required. An additional light grey gauze fabric was applied between the historical window panes as an additional technical light shield. 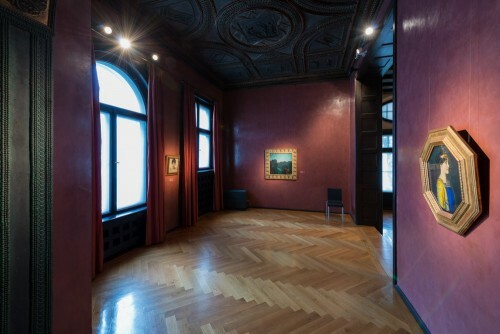 The runners for the stairs from the vestibule through to the old painting studio of Franz von Stuck were provided by Buchele, the red rope barriers as well as handrail cords were produced by Posamenten-Müller. 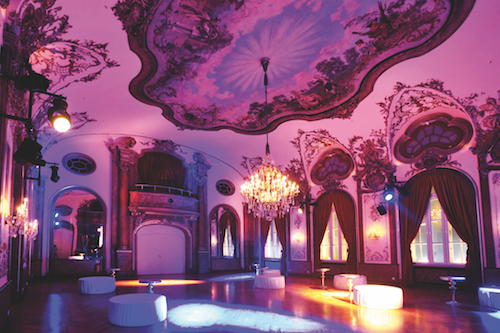 Equipped like a ballroom, it displays its impressive effect as a representative exhibition room and banquet hall. 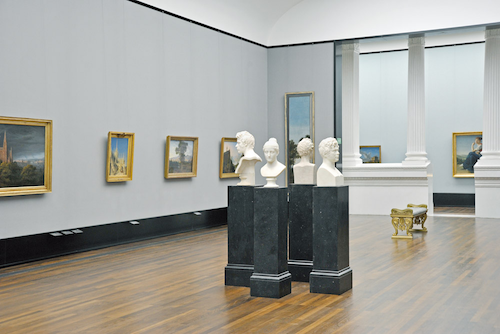 The synthesis of arts of Villa Stuck presents the works of the host in changing presentations in the historical rooms. 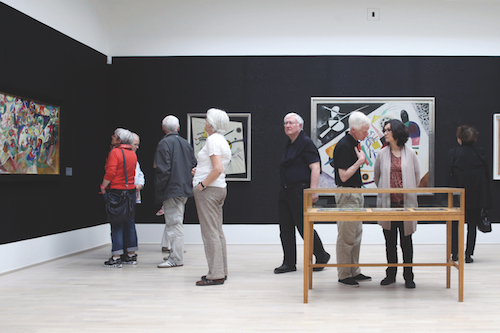 The new atelier (1914/1915) and the former bedroom are used to display changing exhibitions from the 19th through to the 21st century, which transforms the artist’s house into a truly lively place to experience art. 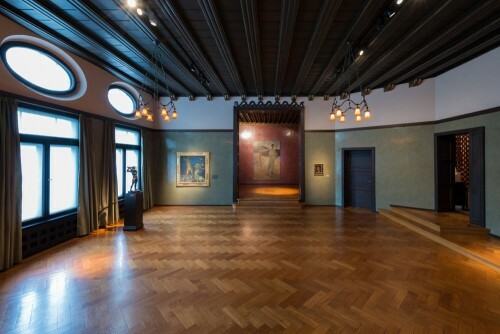 The Städtische Galerie im Lenbachhaus was opened 1929 in the former artists’ residence of the painter Franz von Lenbach. 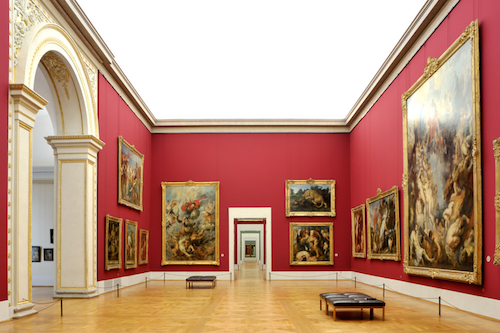 After the renovation and construction in 2013, this world-class museum can now be seen with a new and surprising appearance. 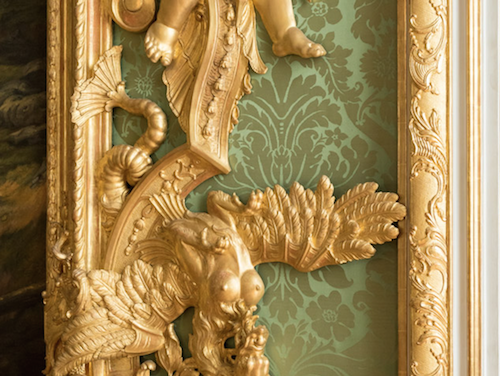 In the 90s of the last century, the walls of the readjusted representation rooms of the “host” Franz von Lenbach, in the historical studio building are covered with faithful and valuable as well as exotic fabrics, that were “provided” and fastened by Buchele. They were carefully removed during the general renovation, properly stored and protected in order to be able to carefully attach them later on. 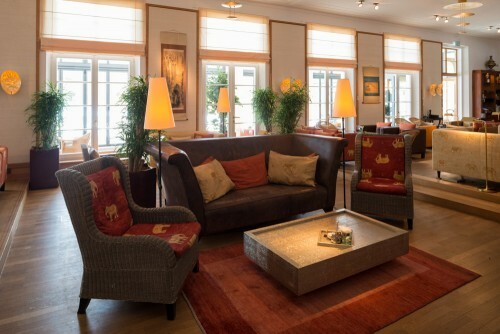 “There are not many people capable of doing this”, said house manage Andreas Hofstett, “a wonderful service!”. In the cube of the modern new building, there is an overwhelming collection of art of the “Blue Rider”. The impressions of Wassily Kandinsky hang in a puristic exhibition room on broad, dark grey, classy silk moiré strips in order to best highlight the works of the artist in an inimitable manner. It was also important to include the rear of the structure in order to ensure that nothing on the fabric was damaged by the presentation of the works. 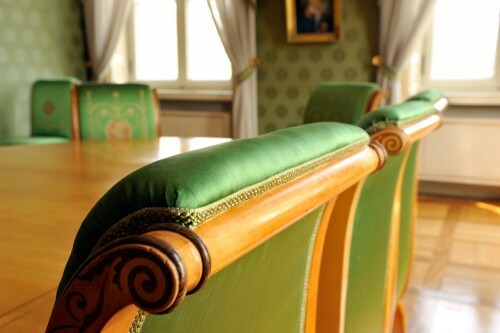 In the artist rooms, the observers have been provided with historical museum benches, whose upholstery was the work of Buchele and covered with the finest leather. 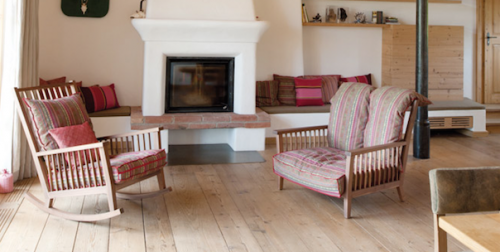 The underlying original basketwork of the furniture was excellently restored. “It represents the significance that Buchele always displays. He does things right and the way things should be done”. 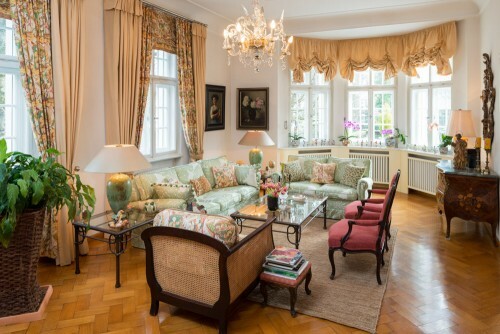 This villa in the Bogenhausen district (Munich) is a prime example of how traditional classic architecture can be harmoniously combined with contemporary interior decoration. 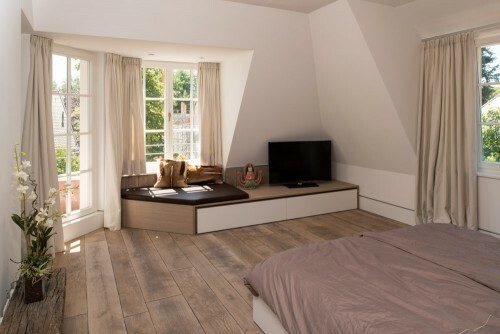 The new build of 2011, reminiscent of a Munich-based town house from the 19th century from the outside, was to maintain a comfortable atmosphere on the inside with the old door frames, existing built-in stairs and specifically created stucco in combination with modern elements. 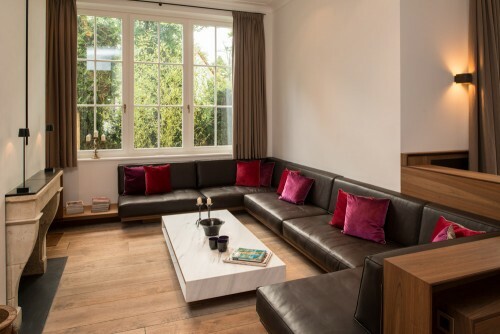 Each architectural detail, the lighting and furniture was created specifically for this project by a designer. “During this exciting task, I was reminded of Buchele and I chose him because I had already successfully worked with him in the past and knew that he can do everything: old and modern”, said the commissioned interior and product designer Michael Neumayr, who now lives and works in the USA. He now imparts his experience to his students as a lecturer at the renowned Art Center College of Design in Pasadena. “Ok, let’s think about it and we will find a solution”, this is how the fruitful cooperation began. During this project, the interior architect needed someone that really understood his craft inside and out and could indicate possible problems in a timely manner, so that they never even occur. “Andreas Buchele understood what I wanted straight away and was always there”, said Neumayr and expressly highlighted the close dialogue and the extensive know-how that this extraordinary project involved. 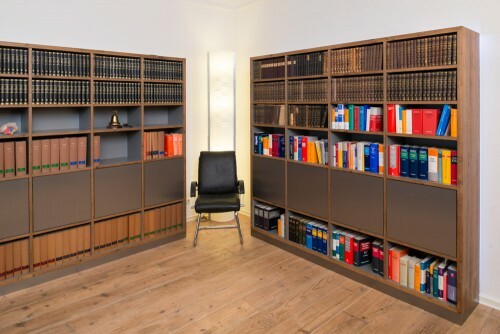 In the impressive library that looks classic but is modernly furnished, in addition to the upholstery and the curtains, Buchele also produced the wall panels in a vegetable-tanned leather with robust seams incorporated into it that were also used in the wooden doors of the cupboards. The scenic beauty of the Fünfseenland has always attracted painters and writers, musicians and actors, scientists and entrepreneurs. Thus, the grandfather of Karl Dreer founded his carpenter-business in Dießen at Ammersee many decades ago. Today, his creative grandson and successor employs twenty five people. In the planning office and factory for interior design in the neighbouring Raistin, they work on drafts, the complete implementation plan and finally, the complete and turn-key design of exclusive interiors in living spaces and commercial premises. 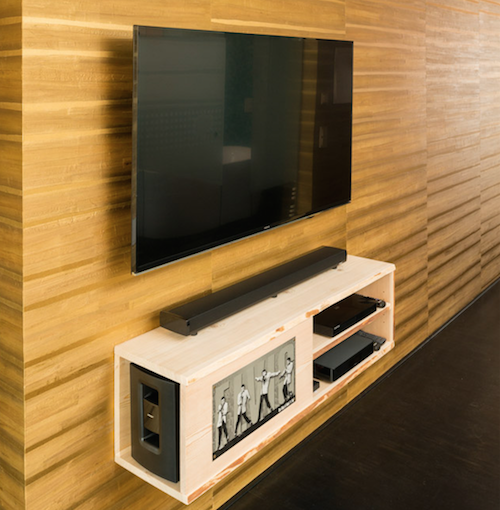 The use of devices with the latest CNC technology enables, inter alia, the individual production of furniture, spray-painted by specialists in the in-house painting shop. In consultation with the interior architects, we place a lot of importance on combining the individual crafts so that everything ranging from large objects through to individual custom-made items are all from a single source – and we are the source”, explains Karl Dreer. 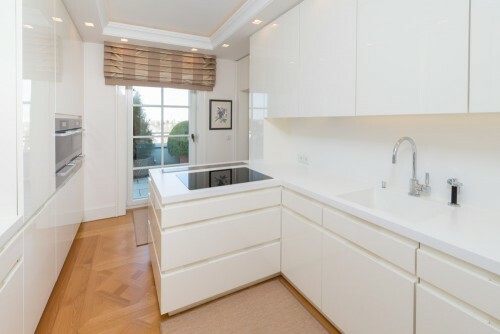 As was the case for the gutted, 500 sqm large penthouse apartment in North Schwabing, a physical activity” within just four months through to the ready-to-move-in completion. 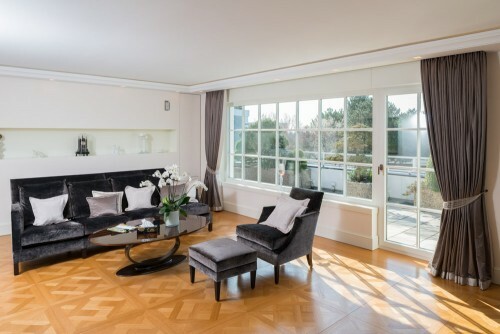 The style: classic but contemporary with classy panel parquet and modern stucco ceilings. 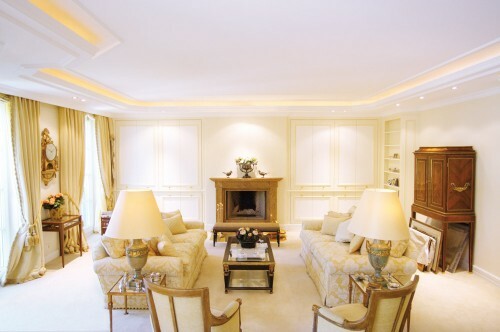 The walls were designed with an exclusive fine lime filler technique in order to maintain the style. 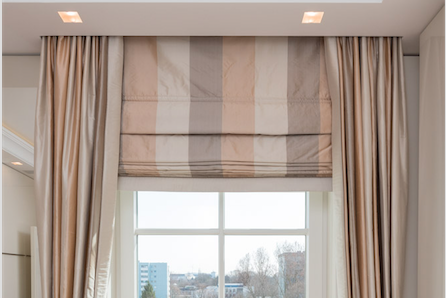 The tasks of “finding the right curtains” was the responsibility of Andreas Buchele. 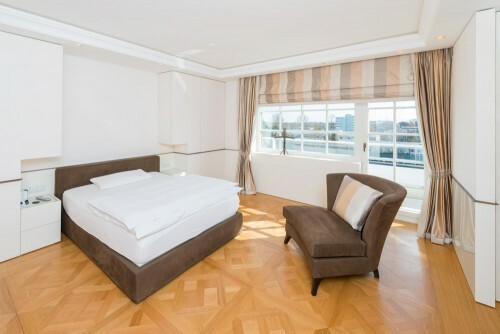 Even the blinds, bed upholstery and the associated throw were all ready on time, so that the owner could move back into her hideaway by the time of the Oktoberfest. Many projects from the areas of architecture, interior architecture and design originate in the studio of mhp-architekten. “The permanent search for maximum quality is our drive”, explains the interior architect and designer Heiner Huber from mhp-architekten. Creativity and innovative capacity in planning and competence and know-how in the execution are important factors for the success of a project and of course, the cooperation with good handicraft businesses. 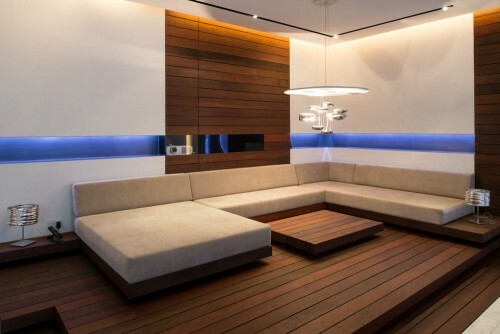 When it comes to interior design, Buchele is an important partner. The large range of selected materials, the command of traditional and innovative manufacturing techniques and absolute reliability in terms of deadlines are some of their greatest qualities. 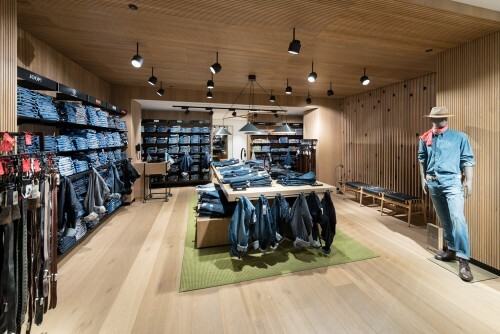 As was the case with the store construction and showroom projects, which mhp realised worldwide for the Munich-based company Willy Bogner. 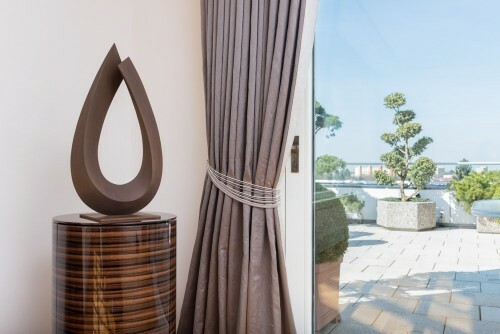 Individual atmospheres of the rooms were developed under the concept of “natural elegance”, characterised by exciting spatial impressions, the use of high quality, natural materials and skilled, precise detailing. 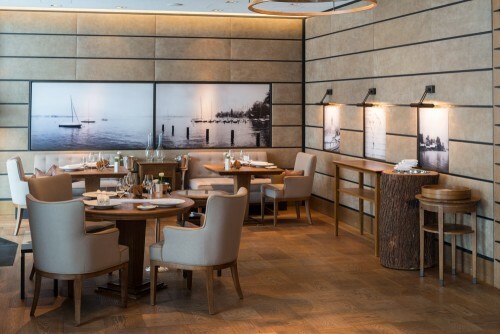 Whether carpets, wallpaper, leather processing as covers or wall covers and textile hangings – Buchele Raumgestaltung is a reliably and competent partner of the constructors and architects in many Bogner projects. “Buchele is also willing to strike out in a new direction with innovative processing and manufacturing techniques and to use materials outside the known context. Like I said, the permanent search for maximum quality…”, said Heiner Huber. 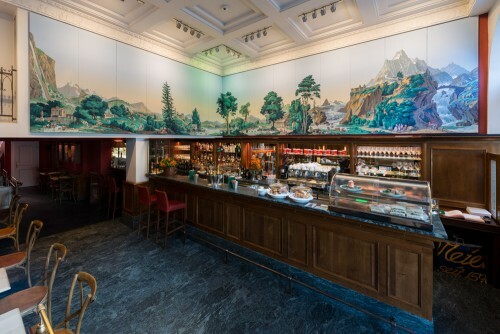 The historic-looking “Münchner Zimmer” in the globally renowned “Kaufhaus der Sinne” [Store of the Senses] uniquely documents how it is possible to combine tradition and innovation at a high level. 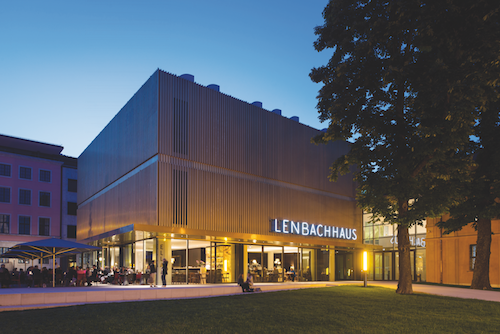 In a picturesque atmosphere, the board member Dieter Münch, tells the eventful story of Ludwig Beck and highlights that there “is nothing better than working at Beck”. 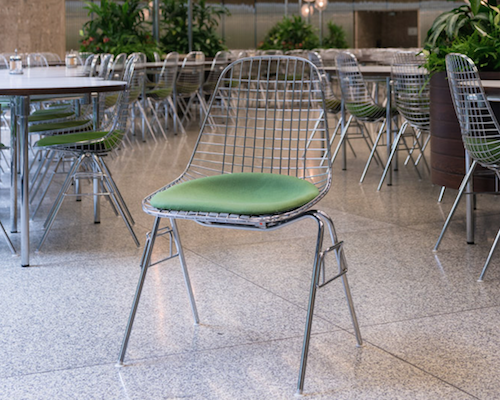 Topics that involve people and employees, as the soul of the house, are the forefront. Here, there is also a link to Buchele, who shares the same philosophy: Modernity and further development are not contradictory to historical values, if understood correctly, they are dependent on one another. 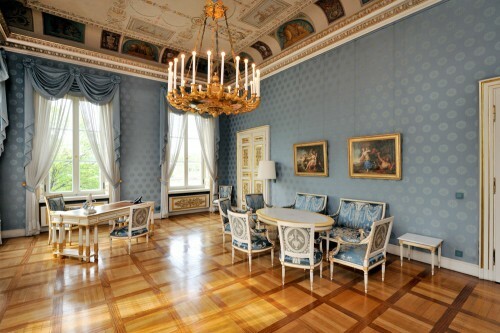 In 1861, the button-maker and master dress trimmer, Ludwig Beck founded the business, in 1876 it was awarded the title “Royal Bavarian Court Passementier” by King Ludwig II in recognition of the goods and services. The business man Gustl Feldmeier took over the store in 1938 and removed the word “Passementier” from the company name and expanded the range. Since its conversion into a public limited company on seven floors, it now offers designer fashion, brand-name leather goods, a leg wear shop and much more. 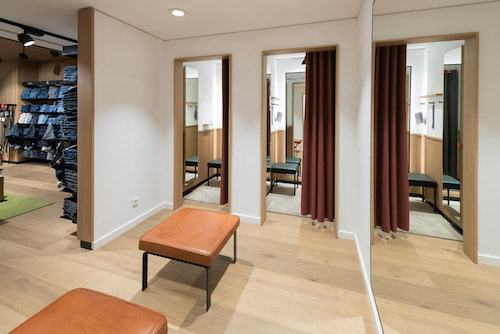 The stylish furnishings of the newly designed men’s fashion department in the basement includes changing room curtains and upholstered stools created by Buchele. Designer chairs were re-covered with fabric, felt and leather and the sales area was covered with carpets. Buchele rolls out the red carpet for store sales and events. As was the case at the unveiling of the large Wittelsbach coat of arms accurate in every detail, which for a long time was presented in the entrance area: Since 2011, with the consent of the House of Wittelsbach the department store can once again proudly call itself the “former purveyor to the court”. The commitment to the roots of the company and the connection to Munich. 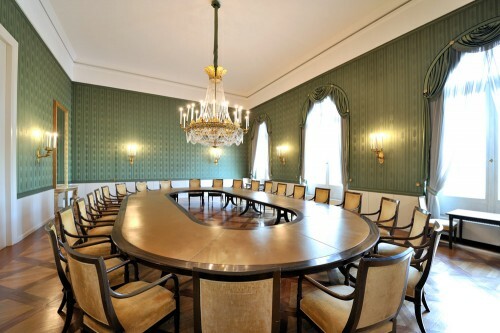 The history of the fifth oldest town hall of Munich dates back to the 14th century: The so-called “Cuvilliés-House” in the Burgstraße was home to a well-known resident for many years, the gifted court architect François de Cuvilliés (1695 to 1768). The well-maintained façade had a rather simple and inconspicuous appearance. On the inside however, the authentic walls, its core maintained since the Middle Ages and the roof structure from the Renaissance Period that is unique in Bavaria both in terms of size and construction, are a special feature. 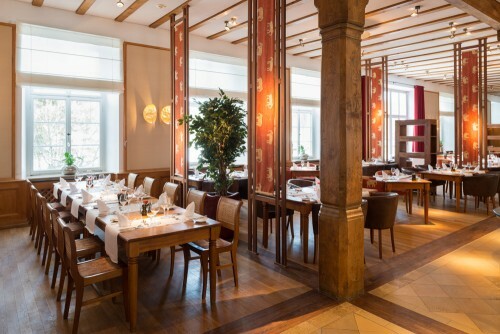 Restored in an exemplary manner, it now houses a lively piece of Munich’s town history. Anyone entering the ancient house will reach the representative law firm of Dr. Grill & Wilde, residing here since 2012 in a charming atmosphere, by taking the historical flight of stairs, known as “Jacob’s Ladder”. 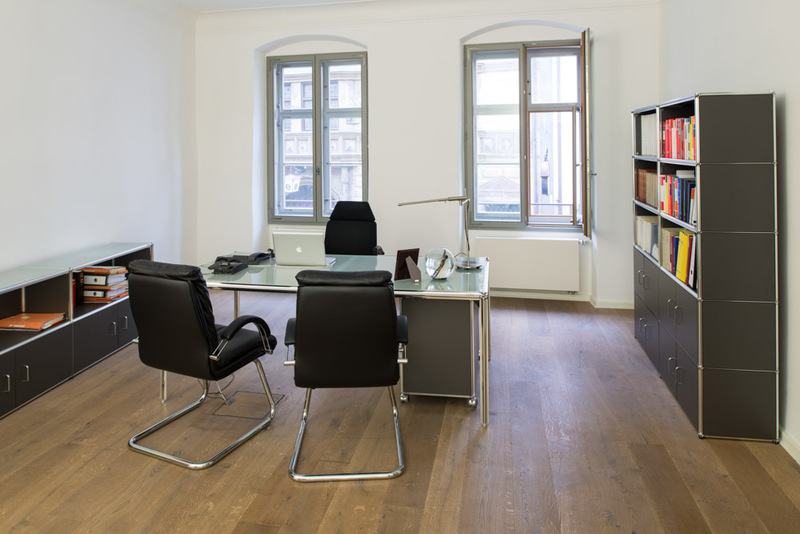 When moving into the new premises, it was decided that: “We will renew everything” said lawyer Carolin Braun from the legal community and assigned Andreas Buchele with the interior. With a mixture of ancient and modern elements, he completely fulfilled the requirements of the employer. 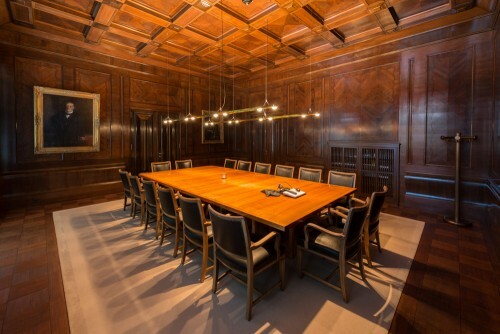 In the library-style, attractive reception and meeting room, there are 300 year old timber-floor boards. The door fittings and windows are faithfully preserved in their original form. The functional, contemporary furniture in the middle of room complement the representation and clarity. 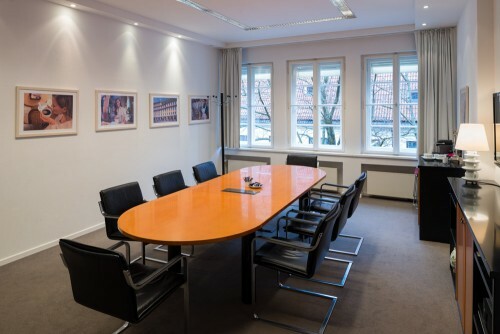 The large table is where the individual and intensive assistance of the clients begins, which is one of the principles of the lawyers. 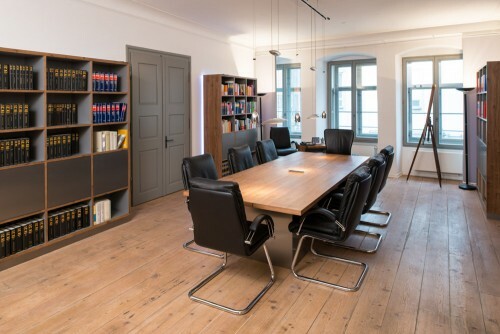 All other working rooms, equipped with Artmodul office systems, represented by Buchele at the Munich market, have one thing in common: They support the creativity of the employees that work there and also emit the feel-good-factor. In the immediate vicinity of the English Garden, the traditional University Riding School was opened approximately 90 years ago. 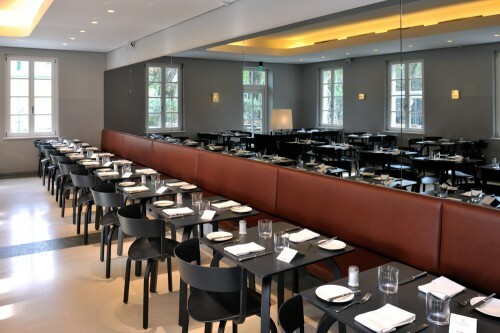 In the heart of Schwabing, this place has been a centre of attraction for horse enthusiasts. The different areas, which all exude their very personal atmosphere, are skillfully arranged in the locality of the historic building: the salon, café, niches, the restaurant and the orangery. 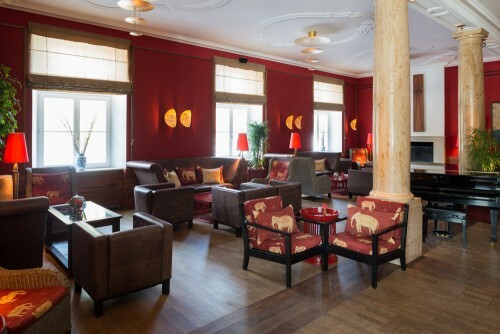 Some time ago, Palais Mai completely redesigned the Café Reitschule – it is a completely different place with regard to the past but still familiar. The architect Ina-Maria Schmidbauer: “In the orangery, we looked for the relation to the horse. 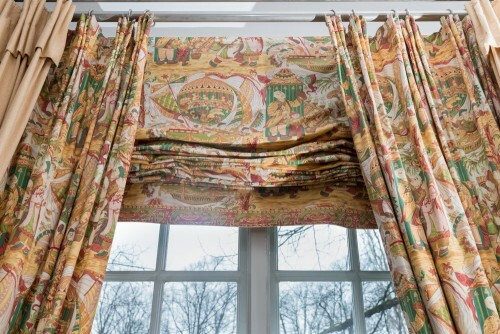 Buchele produced curtains in fabrics that are almost impossible to find anymore. A beautiful, classic tartan fabric on the one side and felt on the other, which is used to cover the billiard table, now that is truly something special.” From the double seat benches of the niches it is possible to see the riders on their horses in the riding arena. 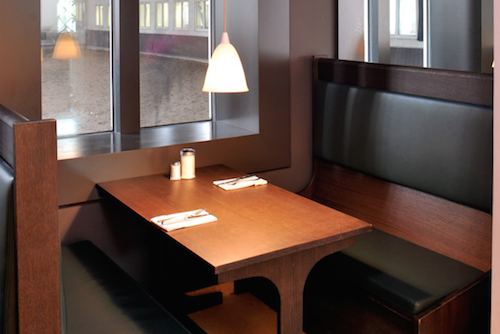 These spaces are by far the most popular in the whole café. 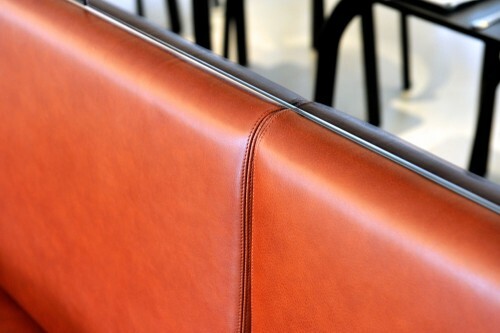 In doing so, the padding of the benches were cover with high quality, dark green leather. 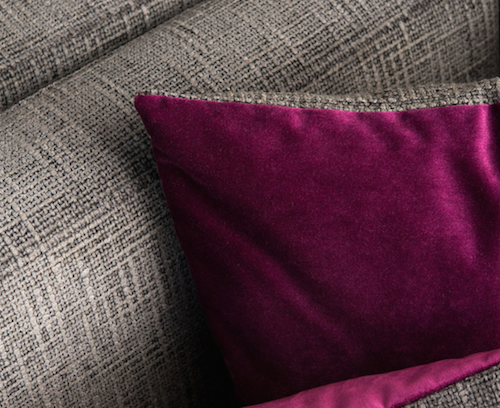 In the salon there are sofa-like seats and chairs with leather in varying warm shades of grey. Buchele has an extensive treasure trove of experience from tradition, which can still able to implemented today. The appropriate suggestions with regard to material conform with the tried and tested products from earlier times. “When it involves material concepts, we trust Buchele, this is particularly true for leather processing. The cooperation results in excellent impulses, which I really appreciate”, said Ina-Maria Schmidbauer. Solving demanding and complex construction tasks is the strength of the npn perseus architects. They understand what it means to skillfully combine the topics of architecure and interior architecture in the tradition of the office founder Paolo Nestler. 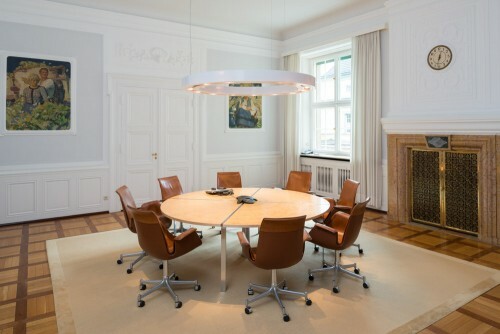 Working under the motto “Transformations”, Rupert Perseus and Kristin Nitzsche took over the demanding reconstruction of the head office of the savings bank, Kreissparkasse München-Starnberg-Ebersberg at Sendlinger Tor Platz. 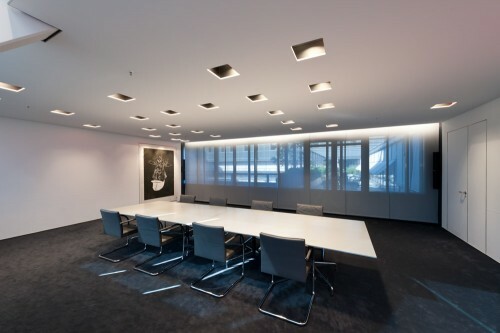 In a delicate manner, the spatial extension of the existing conference room was possible in cooperation with Andreas Buchele. 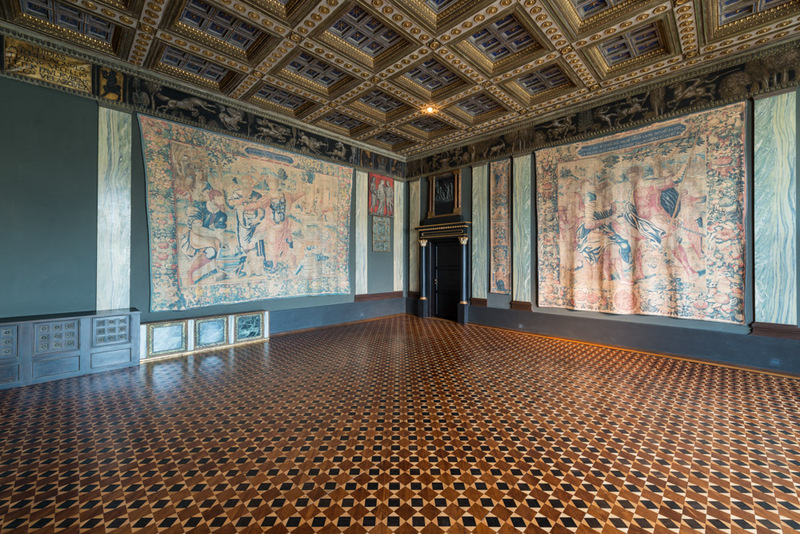 Once this was successfully completed, the district savings bank acquired two works of the contemporary artist Georg Baselitz during the development phase for the redesign of the executive lounge, which were to be integrated in the room. 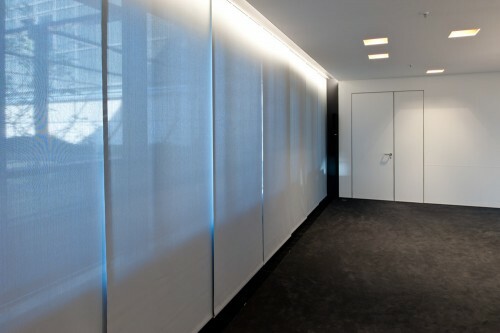 “We wanted to integrate the large surfaces of the walls with a canvas-style fabric – and this can only be done by Buchele. In doing so, the fabric with deliberate seams was spanned on the wall, “so that the craftsmanship can also be seen.” The linocut prints were flush mounted in the wall, sunk-in so to speak. 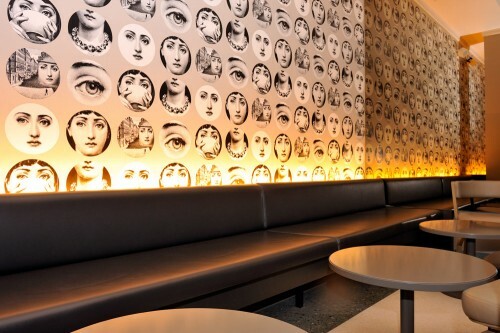 The artistic incorporation in the textile wall coverings makes it look like the images are printed on the wall. 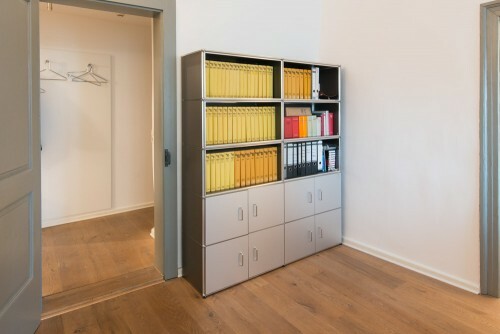 The fabric covered doors disappear flush into the wall, so that nothing distracts from the harmoniously integrated prints. The entire interior concept including the covered ceiling surface and the adjusted sun protection blinds developed into a symbiosis composed of space, light and art. “The Buchele crew always look for a possibility, draw on all suggestions, never say “that’s not possible” and bring with them the necessary qualification to find project-related and specific solutions”, said Kristin Nitzsche. “Buchele is an excellent and reliable handicraft company. 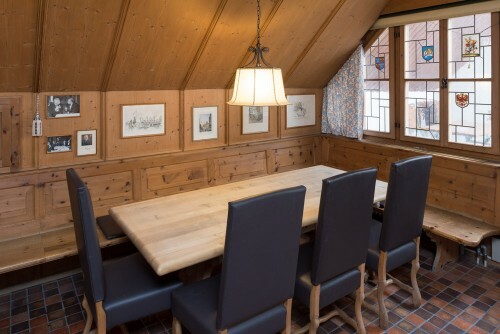 You notice the tradition and the bond to the craft and the empathy to restore existing old buildings with sensitivity and old techniques”, said graduate architect Silvia Elstner-Schibalski, head of surface and inventory management at Munich Re. She certifies that Buchele uses a lot of intuition during the selection of the correct colours and methods when it involves the restoration of furnishings. 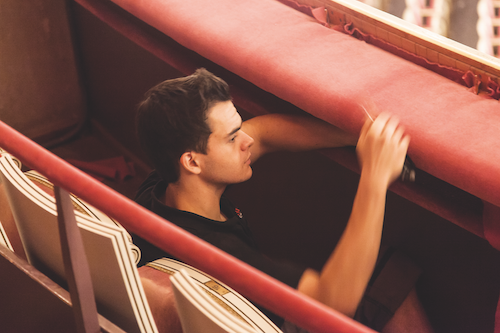 Leather and upholstery work, curtains and chair covers are part of the demanding field of responsibility. And she continues to say: “Patient during sampling, fast in the implementation and with it, an excellent understanding of service. The Munich reinsurance company, today Munich Re, founded in 1880 by Carl von Thieme, is now one of the world’s leading reinsurers. 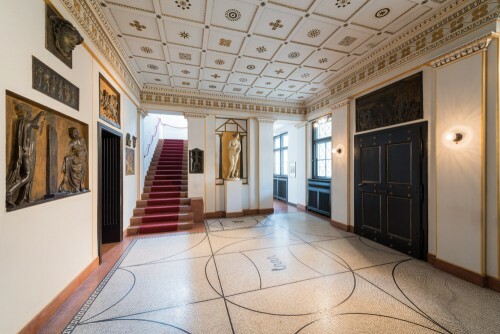 The opulently designed main building with the ornamental courtyard at the Königinstraße in Schwabing is characterised by the art nouveau style and classicism. It was completed in 1913 and since 1973 it has been under monumental protection. 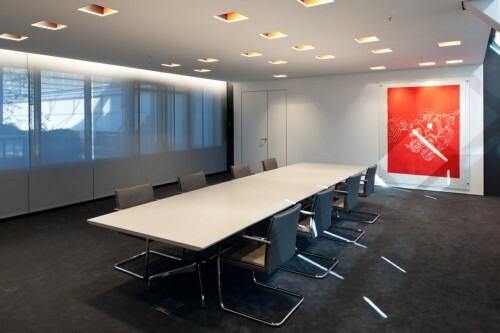 Munich Re displays modernity and a forward-looking approach with the office building on the Berliner Straße. 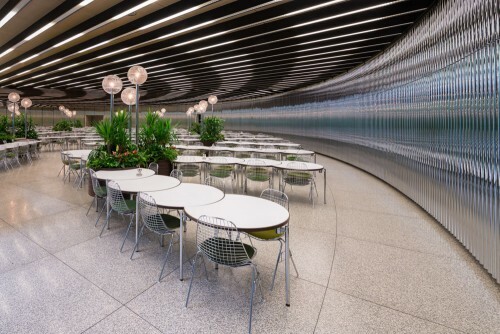 Glass and openness in the rooms, a green courtyard, as well as a curved outer geometry completed with coloured ribbons characterise the complex, which was taken into service last year after the general renovation. 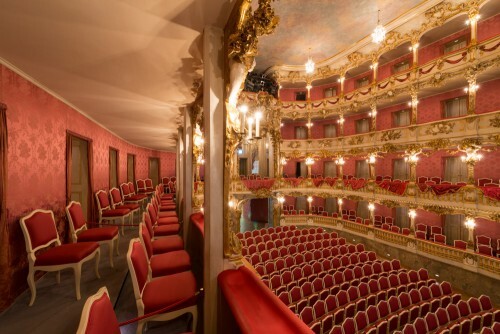 The grand, former Residenztheater – “teatro nuovo pressa la residenza” presents itself as an architectural rarity. 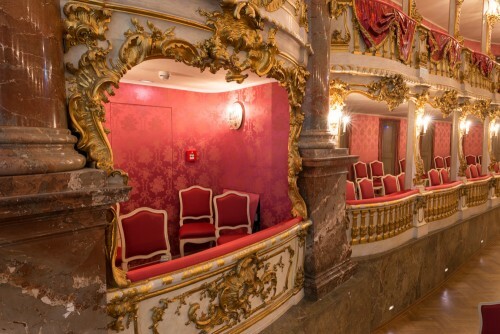 Today it bares the name Cuvilliés Theater and is considered the most beautifully maintained Rococo-box theatre in Germany. In the mid 18th century, it was constructed by Elector Max III Joseph according to plans of the French architect François Cuvilliés. Parts of the artistically carved box cladding in the auditorium were able to be saved before the complete destruction of the theatre in the Second World War. End of the 50s, it was faithfully reconstructed within the residence complex not far from its old location. 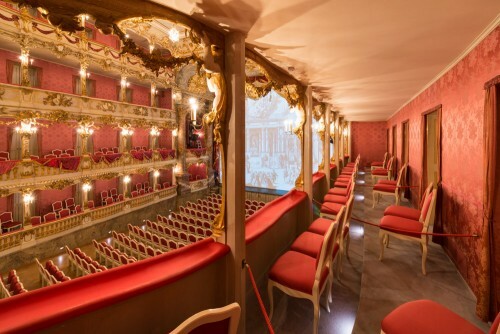 The building has more than 523 seats and in addition to opera and theatre productions, it offers a podium for numerous cultural events such as award ceremonies, readings and rounds of discussions. The theatre jewel can also be visited separately. 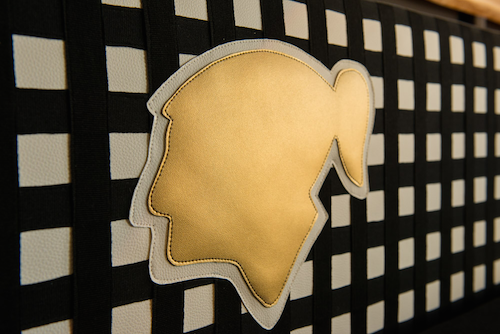 Gimp braids were produced for the seats and the historical spun braids were reproduced for the wall design. In 1956 original weaving cards were “found” for the historical red damask of the wall covering in the auditorium and in the proscenium boxes. In France, Buchele “found” the appropriate weaving mill. The fabric was partially rewoven as well as the golden yellow fabric for the walls of the box galleries, which at the same time were provided with a sub-construction “right up to the last tier”. 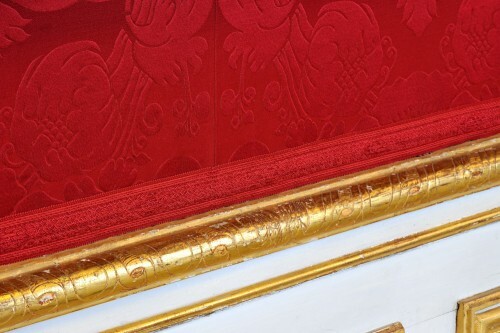 Furthermore, the room design specialists upholstered and covered the tier balustrade with red satin. The rope barriers in the entire theatre area were provided by Posamenten-Müller. 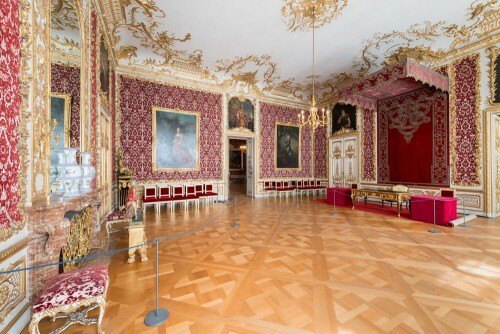 Ernst Götz (former restoration architect at the Bavarian Castle Administration): Textile interior decoration, however quality-focused it was produced, like everything else is subject to gradual ageing and this is not just as result of the strong exposure to light in the castle halls. The fact that the apartments in those day, which the occupants resided in elsewhere, were protected by closed outer or inner shutters, does not change much. 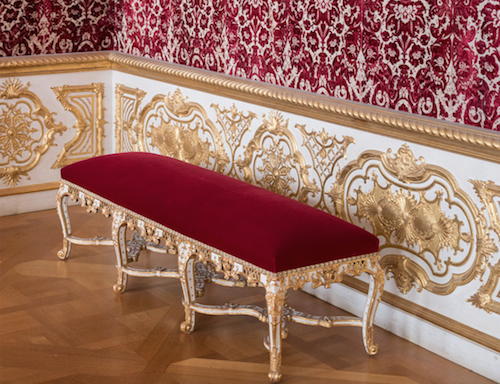 Let us just look at a few examples of renovations of textile furnishings in Greater Munich and how I, as a restoration architect at the Bavarian Castle Administration experienced them. This mainly concerned the new Schleissheim Palace. 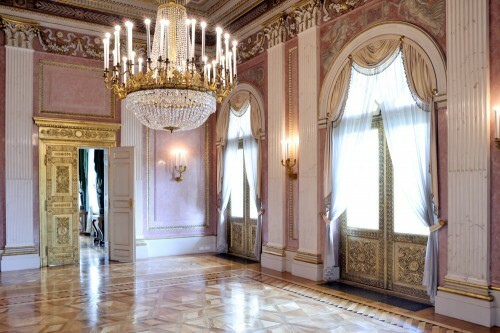 Here, after the removal of the war damages, it was paramount to reconstruct the coverings of the so-called state rooms. 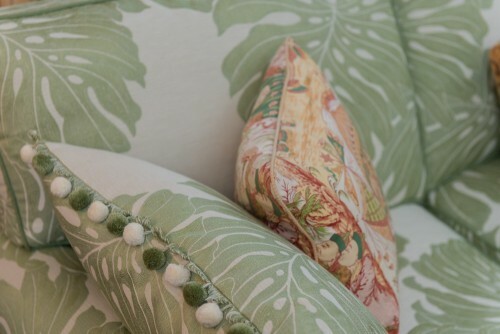 In doing so, this involved both partial renewals in compliance with valuable remainders as well as the exact copying of patterned coverings in terms of colour and other details. 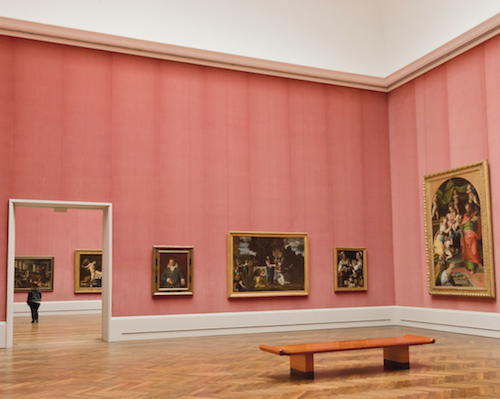 Soon after, halls and cabinets that no longer fully maintained the old decor and have, for a long time, been used by the Bavarian State Paintings Collections as mere painting galleries were to be given new appropriate wall coverings. 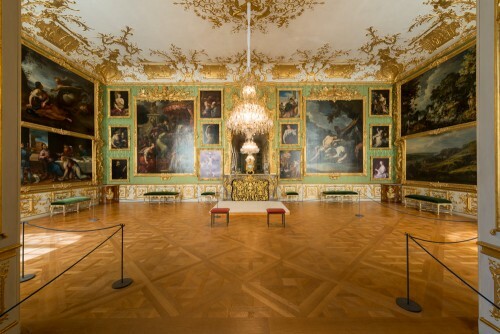 This is where, since the 19th century, the valuable pictures from the Baroque Period hung on rough hessian coverings, which were completely dilapidated. 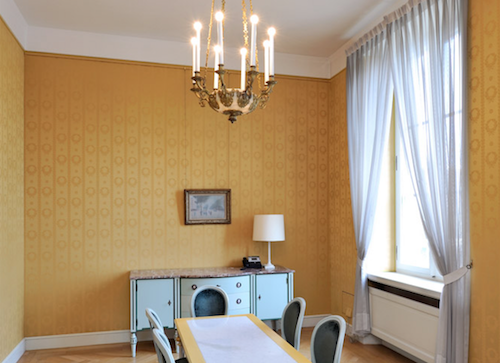 Many mutual discussions between the experts of the administrate authority and the painting specialists led to the decision to mainly cover all of the twenty six gallery rooms with half silk damask. 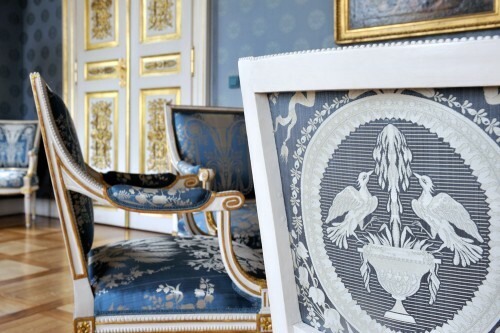 Some of the archived contemporary damask remainders, in the Bavarian National Museum, with three different Baroque surface patterns were used as a guide and specified in seven different characteristics for reweaving. This included other designs. 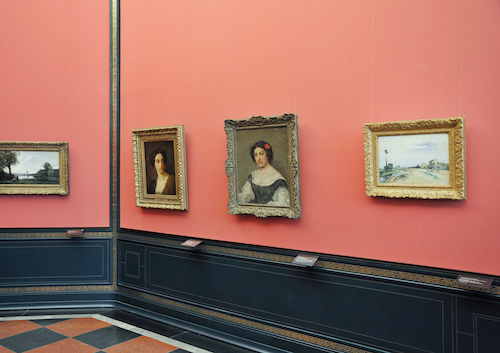 In doing so, it was possible for the museum’s impact to combine the picture gallery with the reminder of the different coloured undertones of the former apartments. 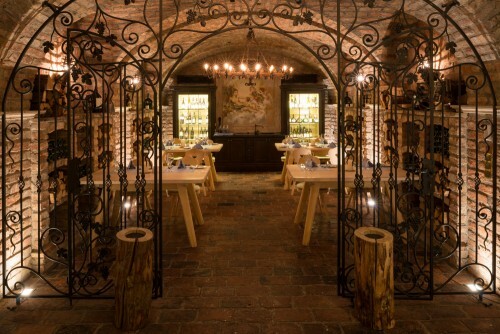 The reproduction of the new woven Schleissheim coverings was carried out by a famous Venetian company. In the partial execution by Buchele, it was possible to rely on the accustomed high quality in the delivery, ability to meet deadlines and extremely precise processing. 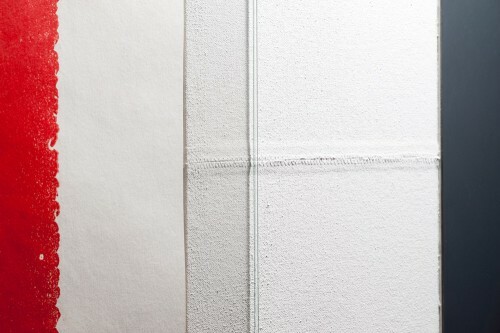 The components of work also include the molleton support-covering and a paper maculature. 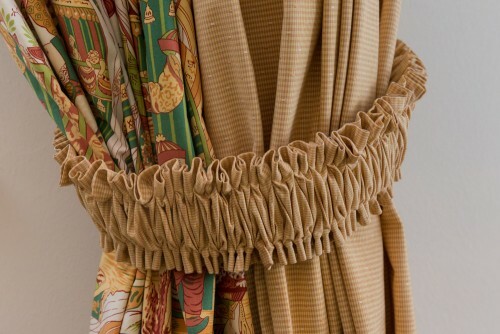 This included textile borders from Posamenten-Müller because in Schleissheim you will not just find all the wall coverings between skirts but they are also framed by braids. The distribution of patterned lengths of covering according to written Baroque Period laws was also essential: how is a pattern repeat placed at the bottom, how does it end at the top, from which length does the overall distribution of a wall take place, how do the ornaments continue in the corners of the rooms? 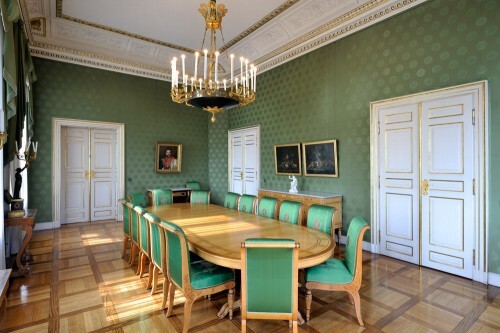 These as well as other questions were jointly solved by the executors room by room. 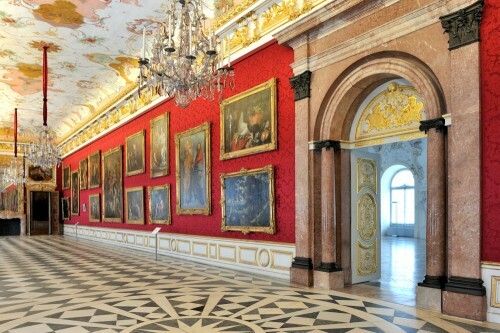 In 2000, there was a renovation of the wall covering in the precious room of the Grand Gallery of the new Schleissheim Palace. 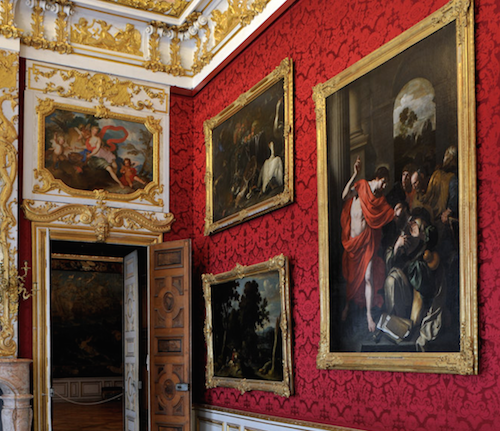 The changes of the textile coverings applied in 1975 to 1977 did not just have to be carried out due to the security fittings of the paintings in the gallery rooms but even the particularly precious red brocatelle covering of the most important painting room had to be realised. Thorough research resulted in divided remainders of the original cover, which now required the re-weaving of the fabric in Lyon. In conclusion, Posamenten-Müller produced the wide borders according to my draft. The eleven, round-arched French doors were give white “cloud curtains” after several preliminary considerations, which proved to be faithful copies of the original ones after the investigations. Working together with practicing monument conservators as an employer and the executing specialist companies requires mutual trust, honesty in a commercial sense and most importantly a wealth of expertise with the following clear execution. Therefore, my collaboration with Buchele and Posamenten-Müller was always positive and crowned with success. 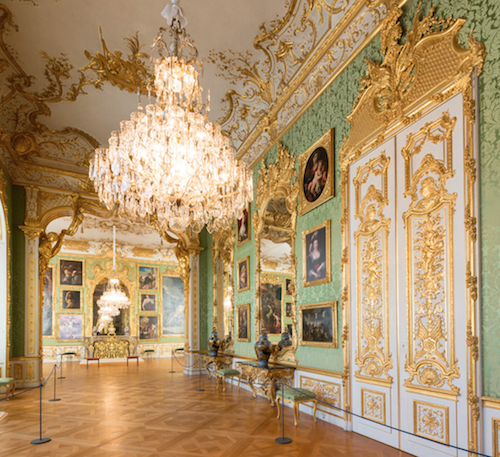 The Munich Residence is the largest inner-city palace in Germany and to date, one of the most important museums of interior design in Europe. 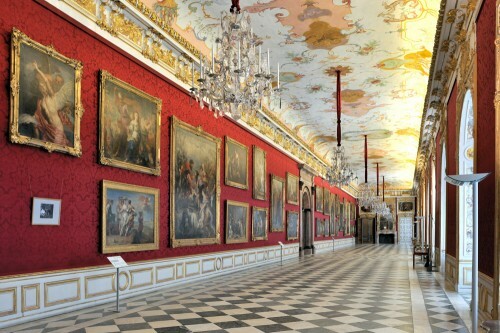 The city palace of Munich was once the residence of the Bavarian dukes, electors and kings.